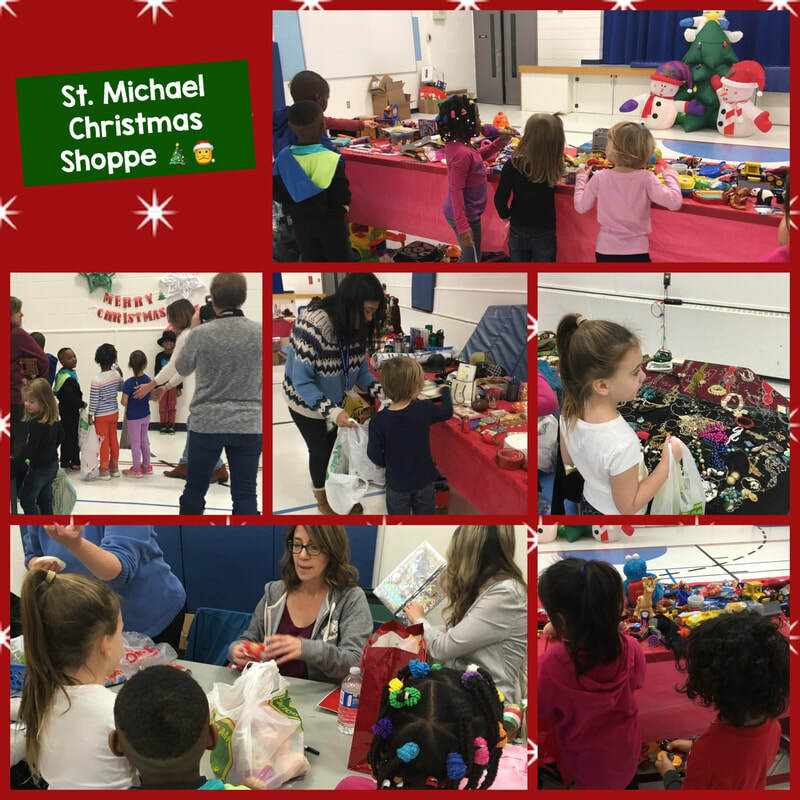 Welcome to St. Michael Catholic School Kinderland! 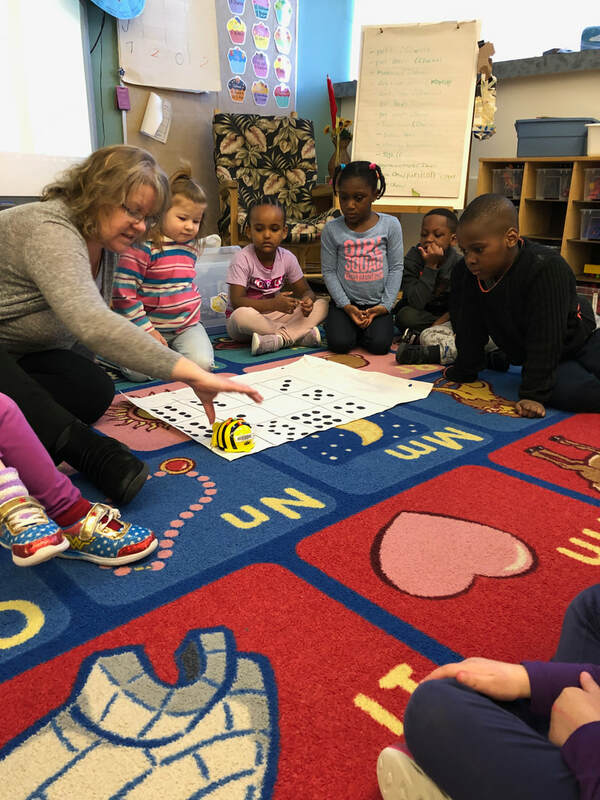 Here is where you will find all the important news and events for both the Busy Bees and Friendly Frogs Kindergarten Classrooms. April has arrived and Spring is finally here! After all that snow, it is nice to feel the warm Spring sun and breezes again. This month, we will be focusing on “Spring/Le printemps” and “Easter/Pâques”. Spring is a symbol of new life. Our activities will invite the children to observe and explore the signs of new life that surround us. Now that the snow is melting away, our schoolyard is very wet. There are many puddles and lots of mud, especially in the grassy areas. The children should be dressed accordingly for our wet playground. Splash pants and rubber rain boots are very helpful in keeping socks and clothing dry while at school. We continue to encourage students to express themselves through the arts. A current favourite activity is painting. We have been providing opportunities to paint both individually and in groups. 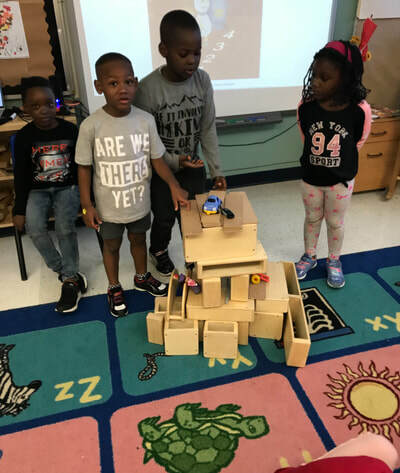 It’s a creative way for them to contribute their ideas and interests. For our Lenten project, our school has been building a kindness chain. When a student does something kind for someone else, their act of kindness is written down on a paper heart and added to the chain. 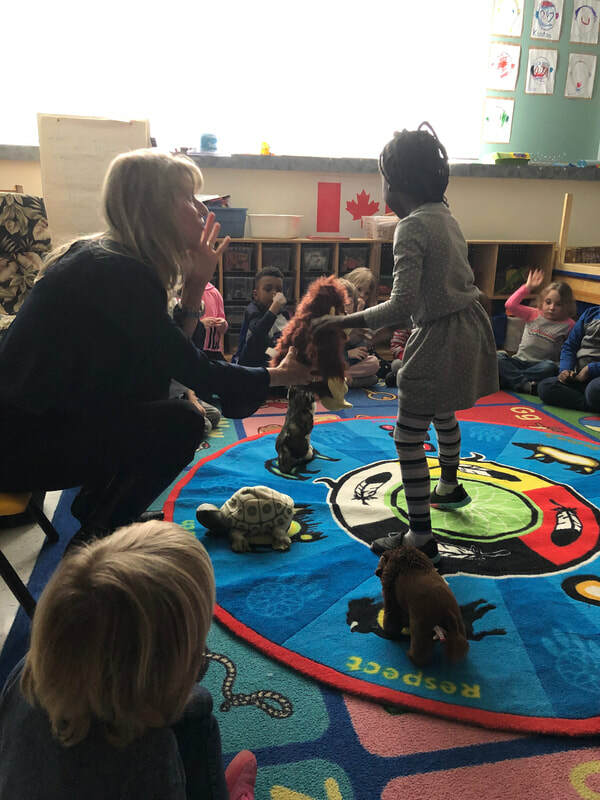 This project fits in well with our Kindergarten program, where we learn about the importance of acting with compassion and kindness. During class discussions, we talk about nice things that our peers do for each other and encourage each other to continue these kind acts. We have been revisiting the importance of using our words to express how we are feeling. Instead of yelling or crying when someone upsets us, it helps to explain to others why we are upset. We have learned phrases such as “I don’t like it when you ___ (grab/yell at/run away from) me. It hurts my feelings. Stop.” We want to make sure that the Kinders are comfortable using these phrases which help them manage their feelings. The letters that we will be focusing on this month are j, z, w and v. Ask your child different letter sounds and actions. We also will continue to learn a new popcorn word each week. Please continue to practice any words that come home in your child’s mailbag with them. 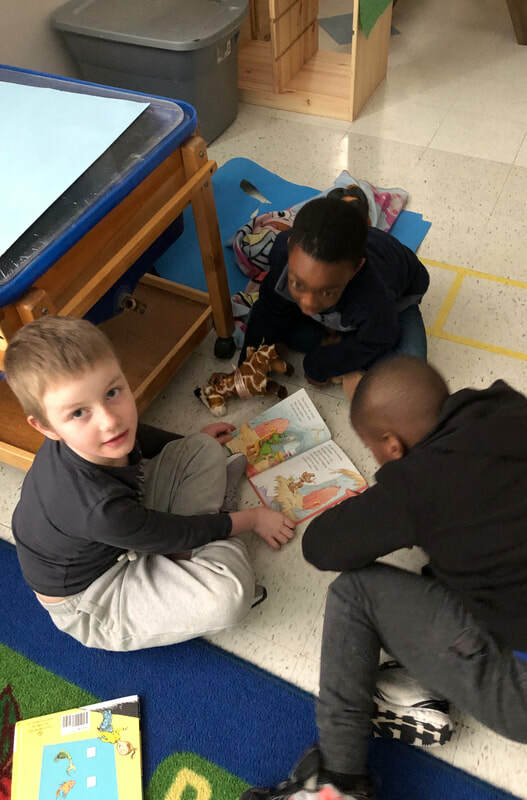 We continue to read guided math books as a class from a resource called Mathology, which help us connect math concepts to the real world. As we talk about season changes, we also will look for the patterns that we see, such as the leaves growing and the snow melting. We also will be making class graphs and having discussions about them. For example, students voted for their favourite animal by writing down their names. We then discussed which animal had the most votes, the second most votes and the least votes. Il pleut. / It’s raining. Il fait soleil. / It’s sunny. J’aime le printemps. / I like Spring. The snow is finally starting to melt, so we are now able to discuss the changes we see in nature that we were hoping to discuss during March. 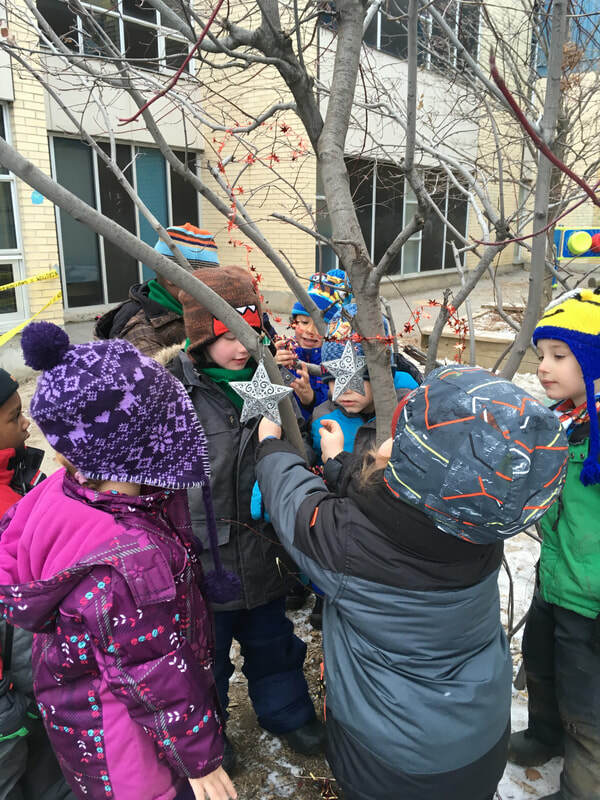 Many students have already spotted some buds growing on the trees! Our Creation Stations are in full swing. The children are independently creating inventions out of recycled materials. It’s exciting to see their unique work! 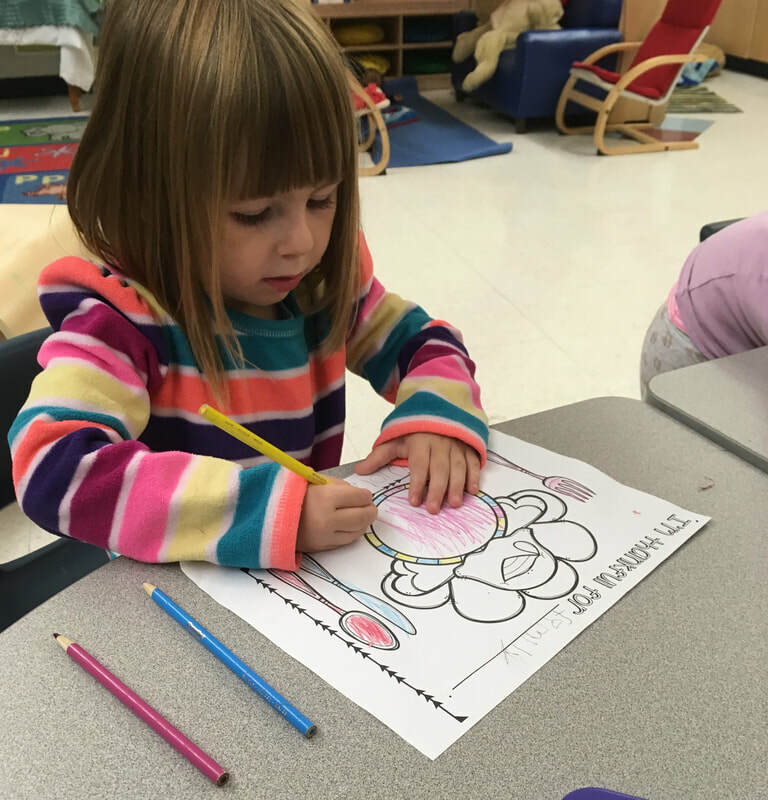 This type of activity helps young learners develop the skills to become innovative thinkers. Please send in any recycled materials (egg cartons, boxes, paper towel rolls, milk cartons, fruit trays, etc.) that you no longer need to help add to our stations! Museum of Nature field trip permission forms will be sent home on Monday, April 8th. Please sign and return them by April 16th. Spring weather means wet weather. Please make sure your child is dressed for the weather (rubber rain boots, splash pants) and has extra socks. Please send in a spare change of clothes in case of a washroom accident. Please check your child’s mailbag each night. Thank you again for those who have joined the Playdough Club. Please check your child’s mailbag for a request sheet. It’s hard to believe that spring will be arriving soon! The children are very excited for the new season to begin. We are just beginning the season of Lent. The students are learning that Lent is a time to prepare for Easter. 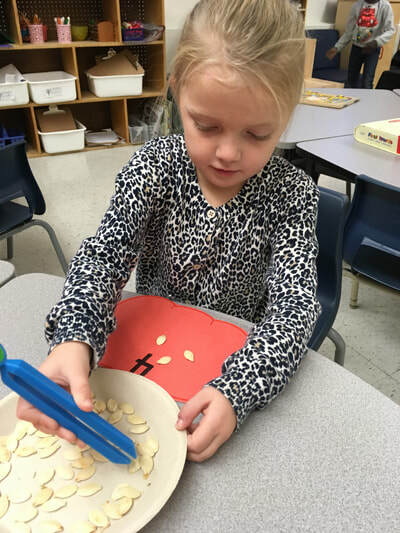 Using Easter symbols and activities, they are discovering that Easter is a time to celebrate that God loves us and that God is the giver of life. By preparing for Easter, the children are learning that doing kind things for others is a way to become more like Jesus. 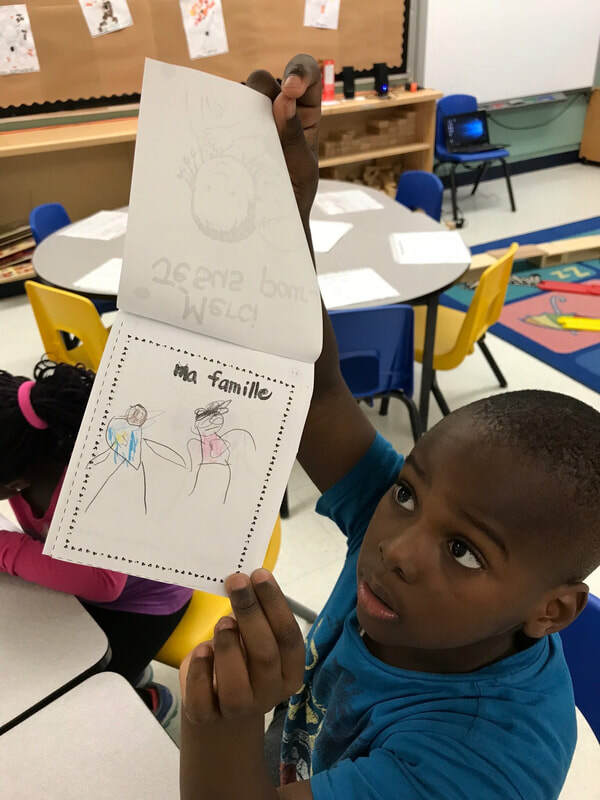 The Kinders have been learning about different people in their communities in both French and English. More specifically, we have been exploring many kinds of jobs that people have and what these jobs involve. We will continue to share personal experiences and discuss how we all contribute to our home, school and neighbourhood communities. We have been encouraging students to express themselves through the arts. 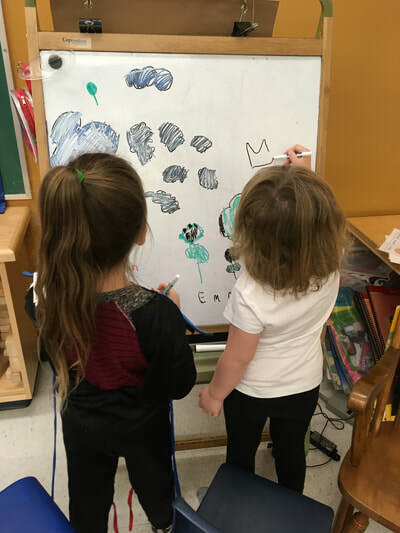 They have been making self-portraits, acting out different characters in the dramatic play area and drawing pictures of their favourite things. We will support their ability to share their feelings and ideas through the arts until the end of the year. We continue to focus on the capacity to make your own choices. The students are reminded to make good choices throughout the day, whether it involves listening during carpet time or using kind words with peers. We also continue to celebrate their ability to make decisions on their own when we notice them choosing new friends to play with or participating in different learning activities. 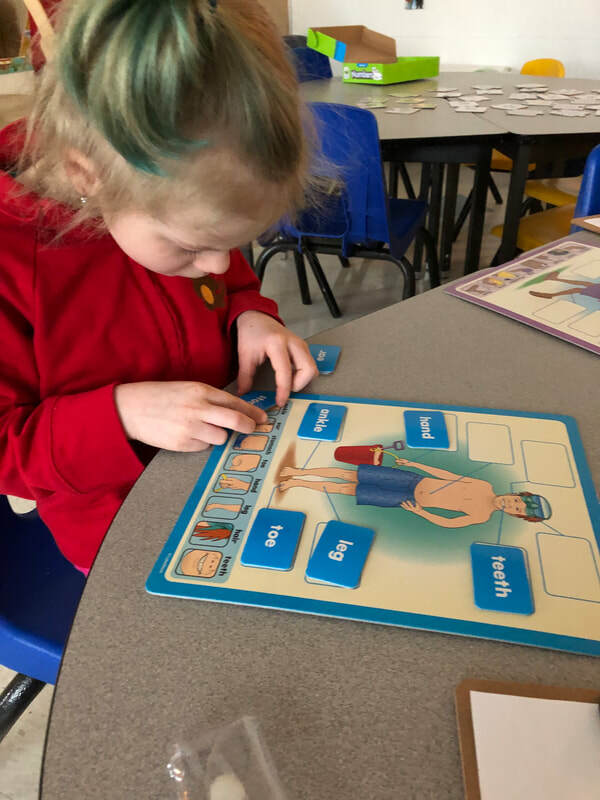 We will spend the rest of the month reviewing the letter sounds and actions that we have learned so far in the first 3 phases of Jolly Phonics. We want to make sure the students have a solid understanding of each letter before finishing the rest of the stages. We also will continue to learn a new popcorn word each week. Please continue to practice any words that come home in your child’s mailbag with them. During our math lessons, we have been reading guided math books as a class. The stories are from a resource called Mathology. The books are fun and engaging and help put math into real-life contexts. For example, we read a story this week that involved children counting all of the animals they saw as they rowed their boat down a river. The students loved the story and also got to hear it in both French and English! 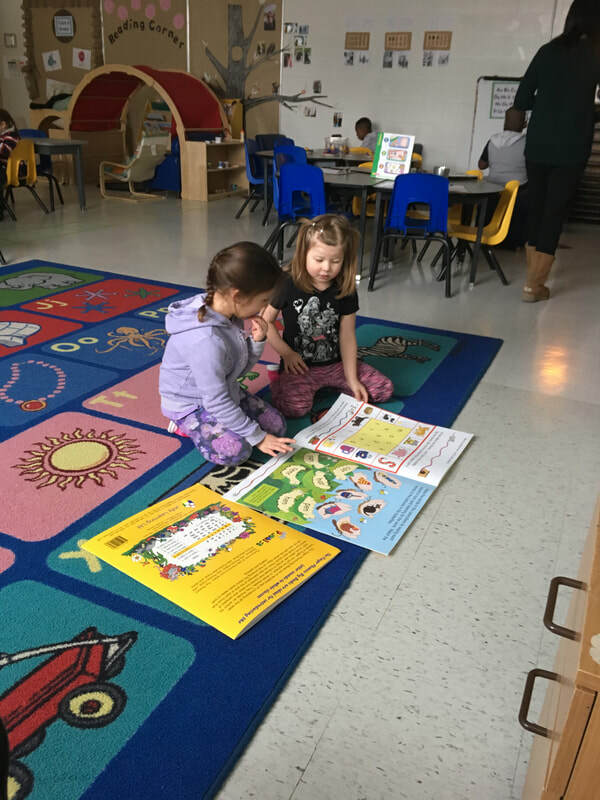 In French, we are continuing to learn about community helpers. After March Break, the children will be exploring and discovering the concepts of movement and travel. We will have various activities and discussions on transportation. Je roule. / I drive. Je vole. / I fly. Je flotte. / I float. As spring arrives, we will have many opportunities to explore and discuss the patterns we see in nature. We will learn more about how seasons always change in the same pattern cycle and what makes each season unique from the other. We will continue to do whole class experiments. 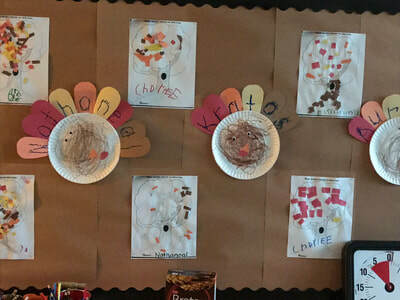 The Kinders really enjoy making predictions and asking questions during these activities. We hope to encourage students to start creating mini-experiments of their own! Blankets for rest-time are being sent home this Friday. Please wash and return them for the Monday after March Break. As spring arrives, we will be expecting some wet weather. Please make sure your child has extra socks and mitts. February has been a very busy but exciting month so far. Thank you to all of the parents who have been sending in extra Kleenex, Ziploc bags and wet wipes. We really appreciate it! The Valentine's Day celebrations have been in full swing. The holiday allows us to explore the value of friendship and caring. We learn to accept each other's differences and understand that our differences are what makes us all unique. We see our differences as gifts from God. The children will learn the value of friendship and caring by continuing to develop such skills as listening to others, taking turns, sharing and lending a helping hand. We have been working hard on recycling various items properly. We have also recently started to collect empty Lunchables containers as a school-wide initiative. Now that students are becoming more comfortable with recycling, we will focus on WHY we recycle. We will discuss kid-friendly videos and books about the topic so that they can understand the importance of their everyday contributions in terms of helping the environment. Over the next several weeks, the Kinders will be learning about the important people in their community and how they contribute. They will have opportunities to share personal experiences about their favourite places around the area, such as where they like to eat or play. We will help them understand that their neighbourhood is another type of community in which they belong to. 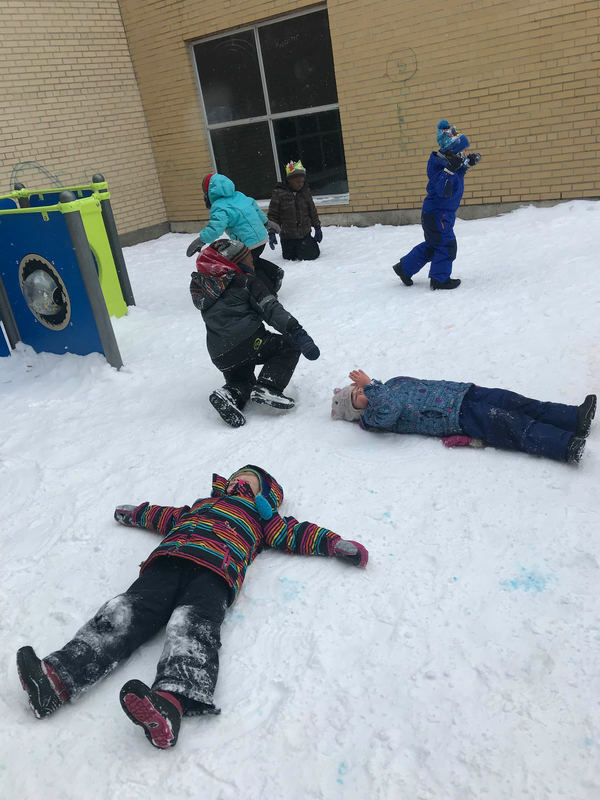 We have been having so much fun playing outside with all of the snow that has fallen so far this winter. With all of this outdoor play comes many conversations about safety. We will continue to help students be aware of what is safe versus unsafe during play. Getting dressed properly by wearing all of our outdoor clothes is another way we stay safe by preventing frostbite. A part of a developed sense of well-being is the ability to make your own choices. 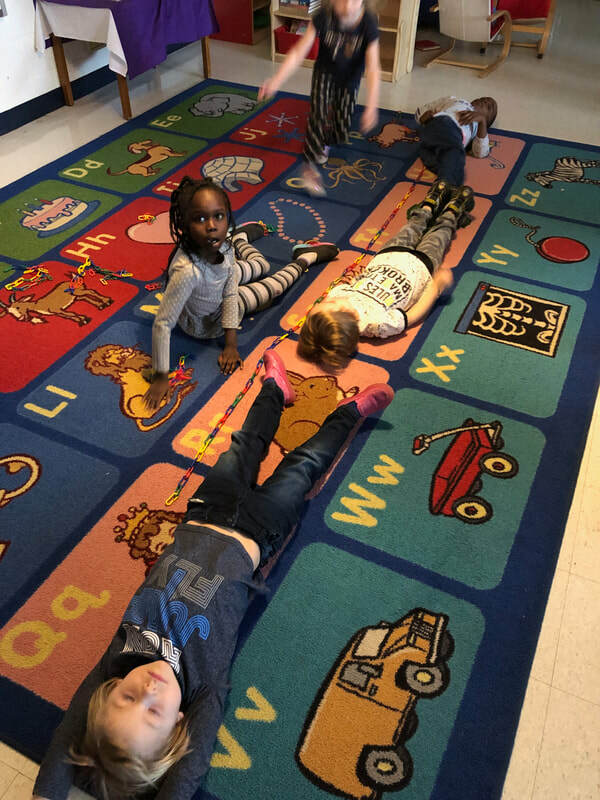 We are celebrating that many of the Kinders are choosing where to play more independently and are comfortable being the first to try a new activity. We are encouraging them to make positive choices and not to be influenced by those around them who may not be doing the same. We’ve seen growth in students’ ability to recognize letter sounds and pair them with actions. Way to go! This month we are focusing on the letters g, o, u, l, f and b. Popcorn words will continue to “POP UP!” around our classroom for the remainder of the year. Please continue to practice any words that come home in your child’s mailbag with them. 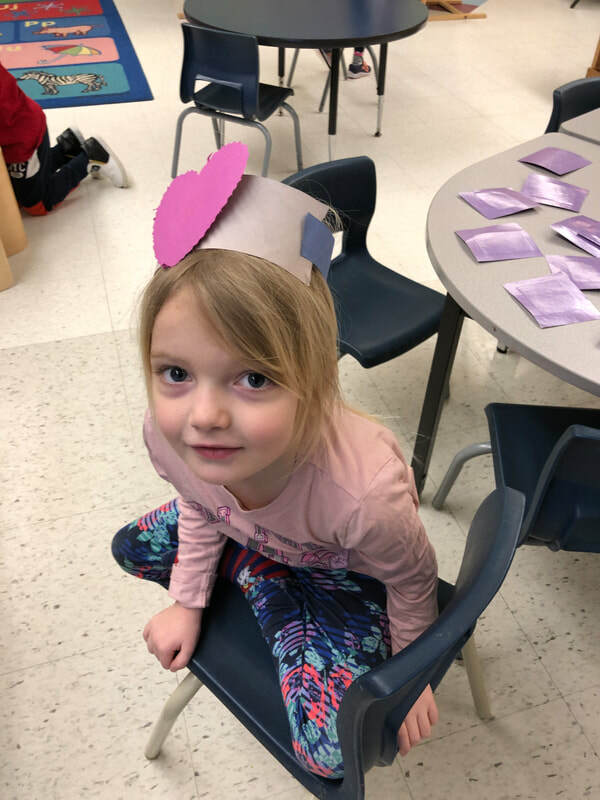 With all of the Valentine’s Day excitement, the Kinders have been busy creating cards and pictures for their loved ones. They are using resources around the room to help them spell their friends’ names, such as name tags and labels. 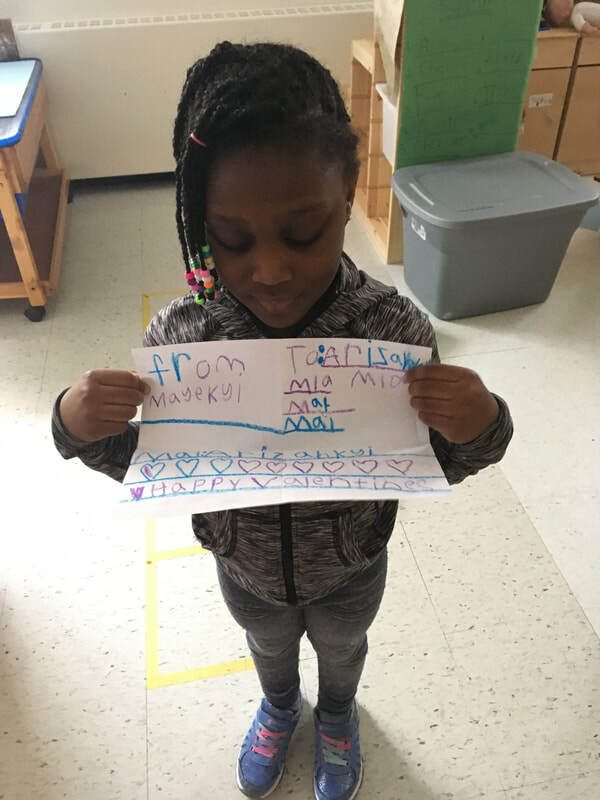 Many have also shown interest in writing special messages. We will support this interest in writing by encouraging students to write for different reasons. 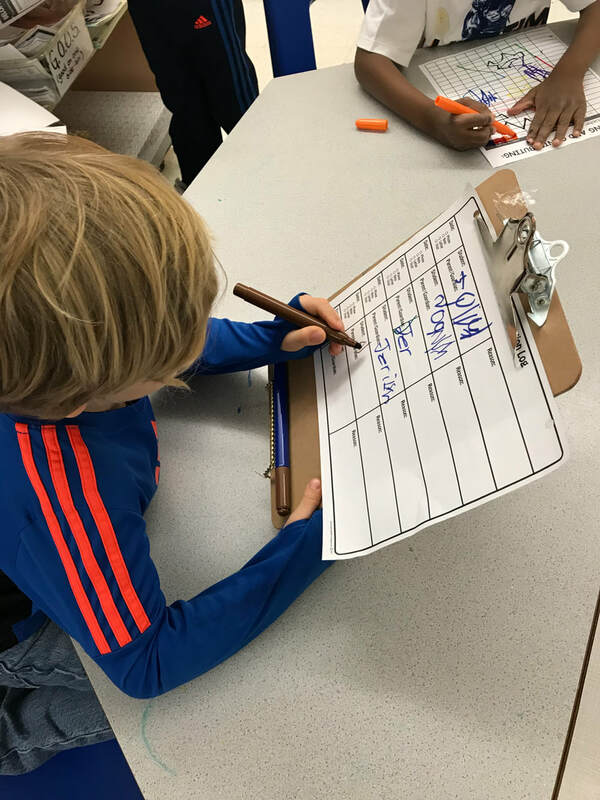 Some examples of different writing opportunities are creating a sign for the dramatic play area, making a list of their favourite foods or signing their name on a class sign-up sheet. Our math lessons continue to focus on the skill of subitizing. Subitizing is the ability to recognize the number of objects in a small set without counting. 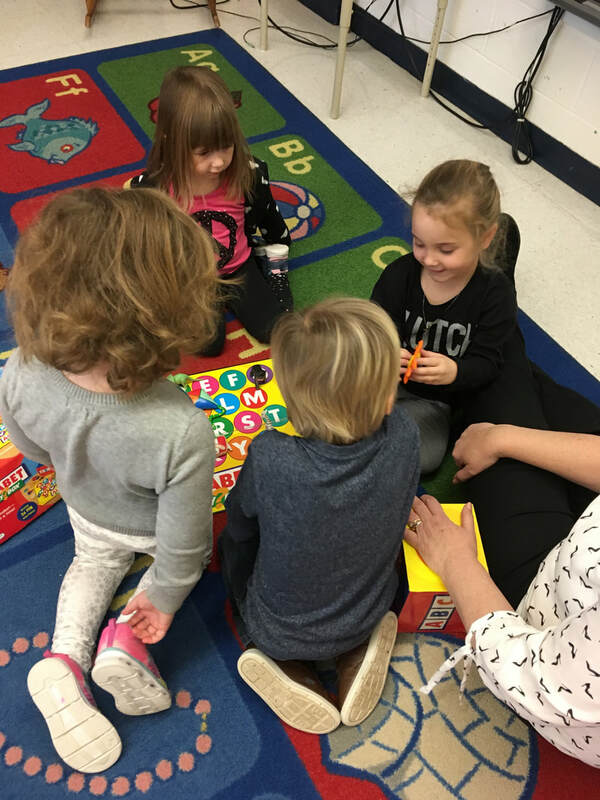 Please continue to practice this skill at home by playing games with your child that require dice or by holding up a certain amount of fingers for a few seconds and asking them how many they see. 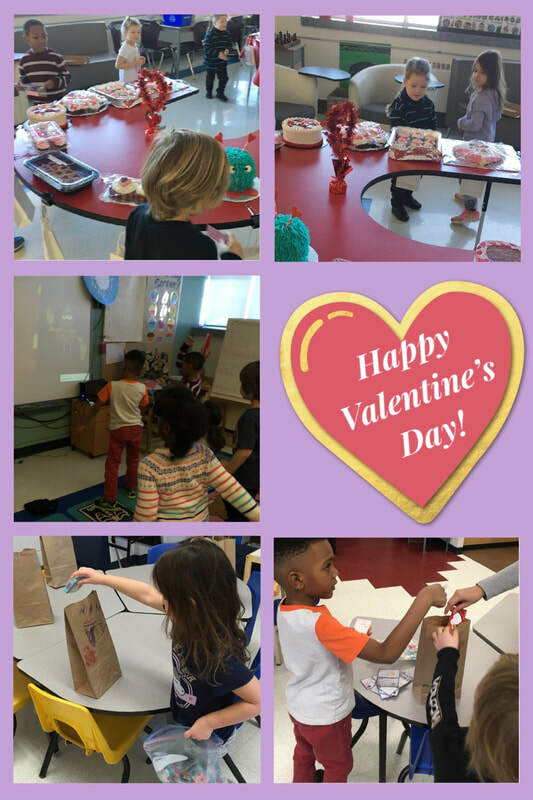 In French, we will be learning vocabulary related to Valentine’s Day, Friendship, people/things we care for, and community helpers. 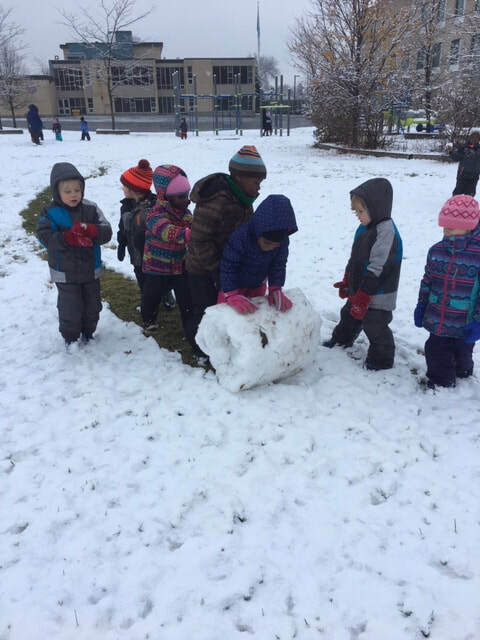 The snow has been making for some fun experiments down in Kinderland! We have had chances to discover whether or not salt makes snow melt faster and what temperature of water melts snow the quickest. As we continue with more experiments over the next few weeks, we are encouraging students to make predictions. We remind them that predictions don’t have to be the right answer but that we would like to hear why they think something is going to happen. We are also encouraging students to participate in our class discussions about the results of our finished experiments. 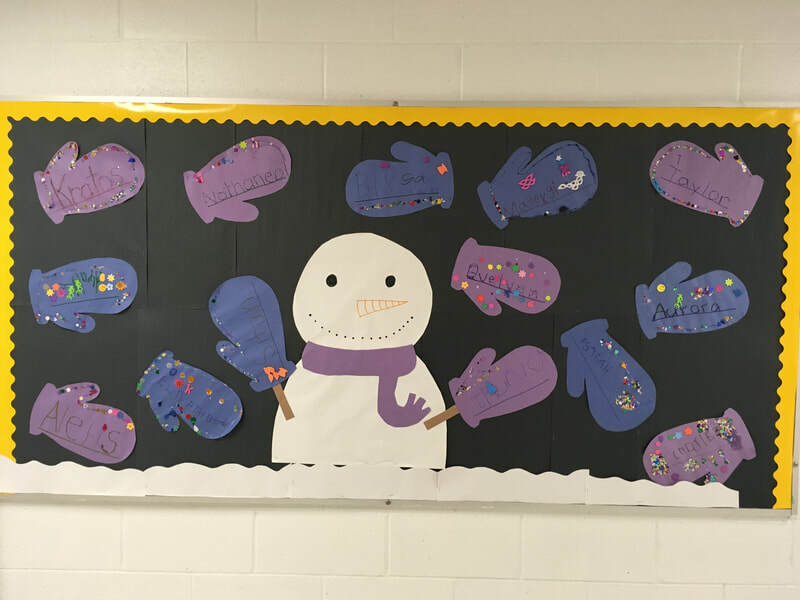 Please make sure that your child has spare clothes, including socks and mitts. Please have your child practice getting dressed for outside. To avoid any lost items, please write your child’s name on all of their personal belongings. February 14th: Valentine’s Day - card exchange and Cake Walk. We hope that everyone enjoyed their holidays and are having a wonderful new year! 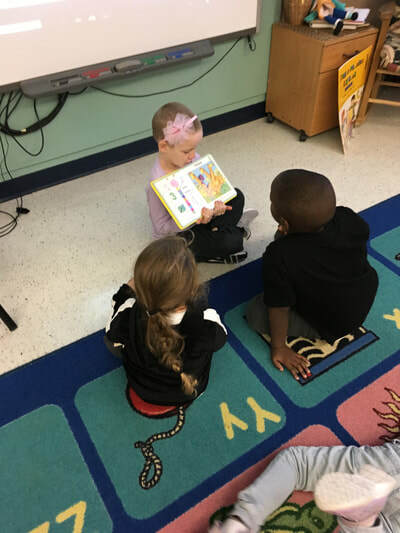 The Kinders are happy to see their friends and educators and have been settling back into routines. This January has had quite a bit of snow so far, which is great for exploration! 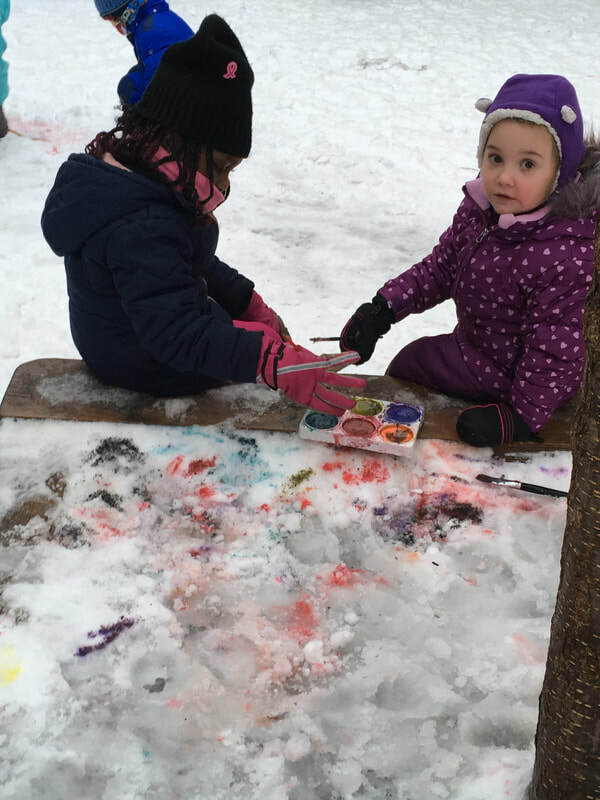 A favourite activity has been investigating what happens when we mix dry paint with wet snow. 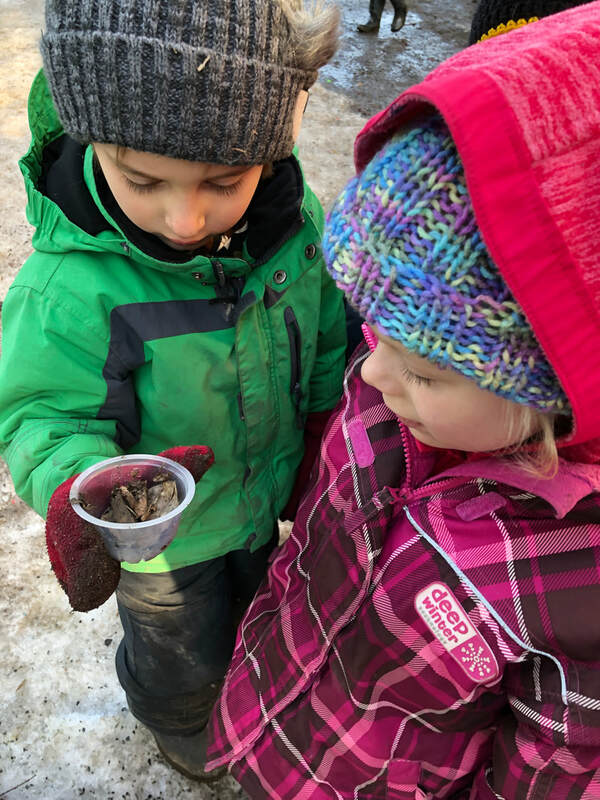 As we discuss seasonal changes, such as the leaves disappearing and the snow falling, the children discover that these changes are exciting and beautiful gifts from God. The idea of belonging to many communities will continue to be a big theme throughout the year. We have been sharing our family experiences and realizing that we have many things in common with each other but also have differences. The children are learning to respect these differences by being open to new ideas and using kind words. The Kinders have also been participating in environmentally friendly practices. They have been learning about the importance of recycling and how our actions can make a difference in the world. One of the classroom jobs is to sort the recycling bins which allows the children to learn they can help the environment. Ask your child to recycle items at home whenever possible. The children are still practicing breathing techniques to help them with their social and emotional needs. The main ones that we focus on are the “drain”, “balloon” and “S.T.A.R”. Ask your child to show you how to use each technique. We have been encouraging them to go to a quiet space when they’re feeling upset and need to take a break and practice one of the breathing methods. 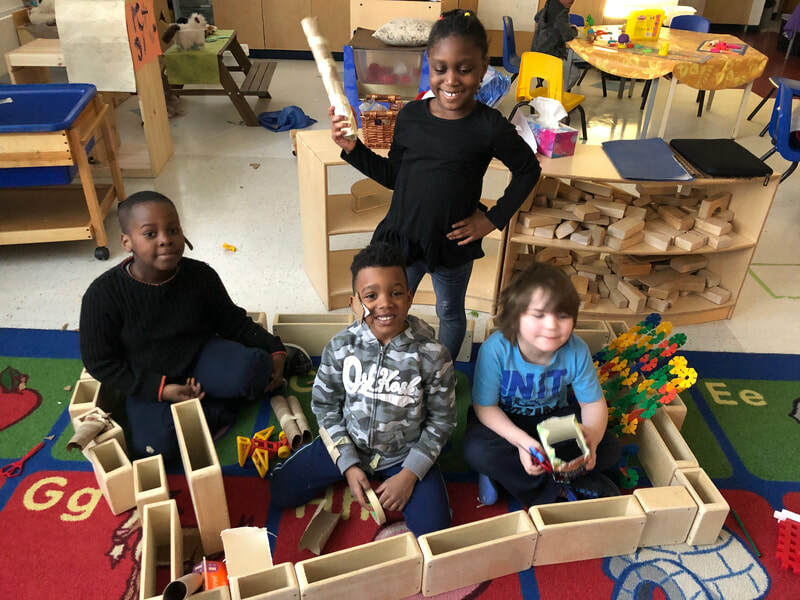 We are helping students realize the benefits of choosing a balance of active (dancing, building, dramatic play) and quiet activities (puzzles, reading, rest time). They are learning that their bodies need an equal amount of both to stay healthy. 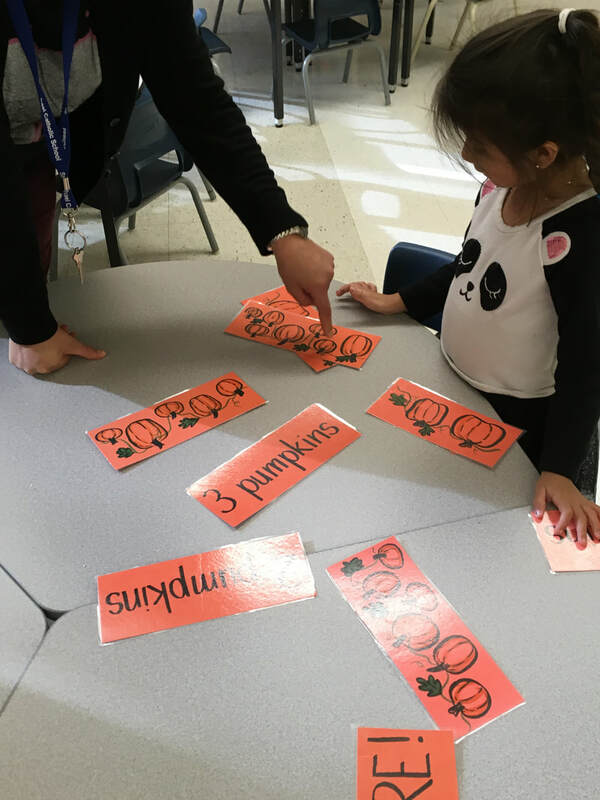 We continue to work on pairing letter sounds with actions so that they are easy to remember. This month we are focusing on the letters c, k, e, h, r, m and d. Ask your child what sound the letter c and k make! In the next few weeks, we will start learning about popcorn words. Popcorn words are words that “POP UP!” frequently in reading and writing. 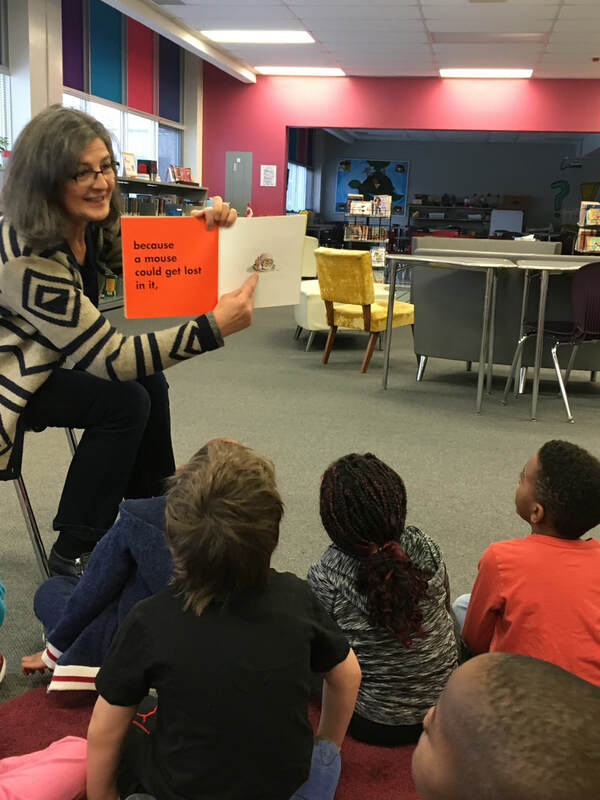 It is important that young readers can recognize the words quickly so that they can develop early literacy skills. If you see these words come home in your child's mailbag, please help them practice reading the words. 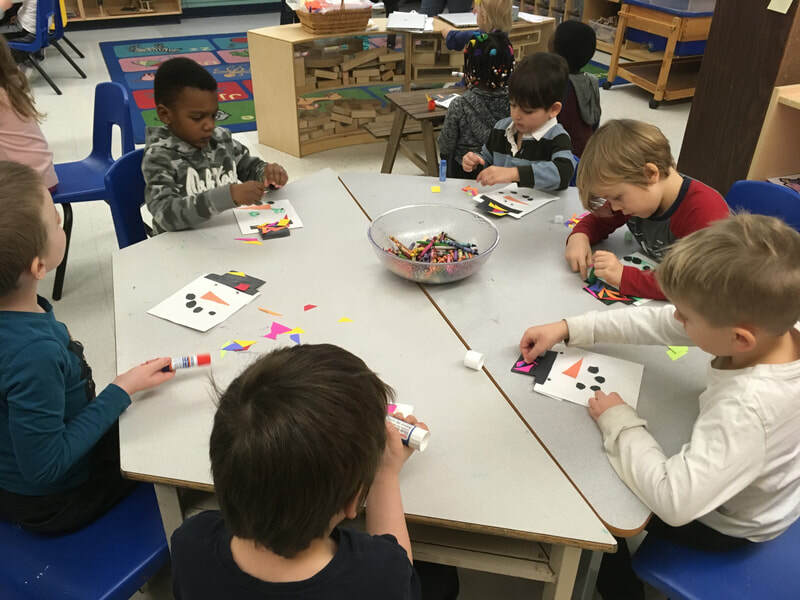 The children have been working on a math skill called subitizing. Subitizing is the ability to quickly identify the number of items in a small set without counting. We have been practicing this skill using dice. For example, we might show the side numbered 5 for about three seconds and then ask the students what number they saw and how they know. You can practice this at home using dice from a board game or even by holding up a certain amount of fingers for a few seconds. 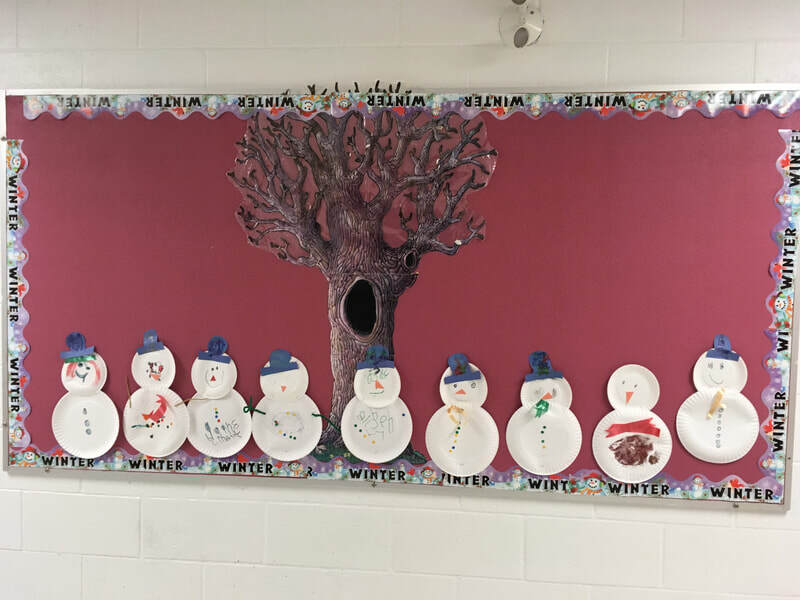 In French Language, we are learning winter vocabulary through activities, songs and poems. 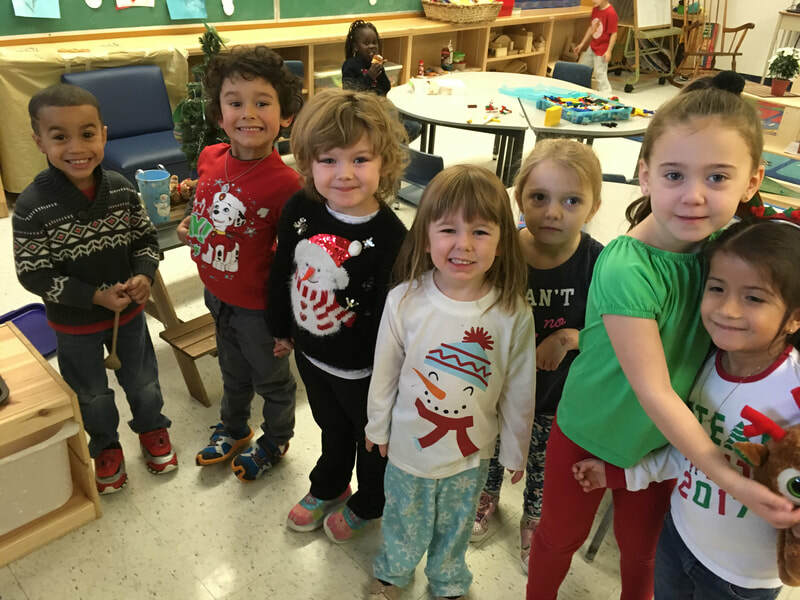 We are focusing on naming our winter clothing in French. Stopping the spread of germs is still a big focus as flu season is here. 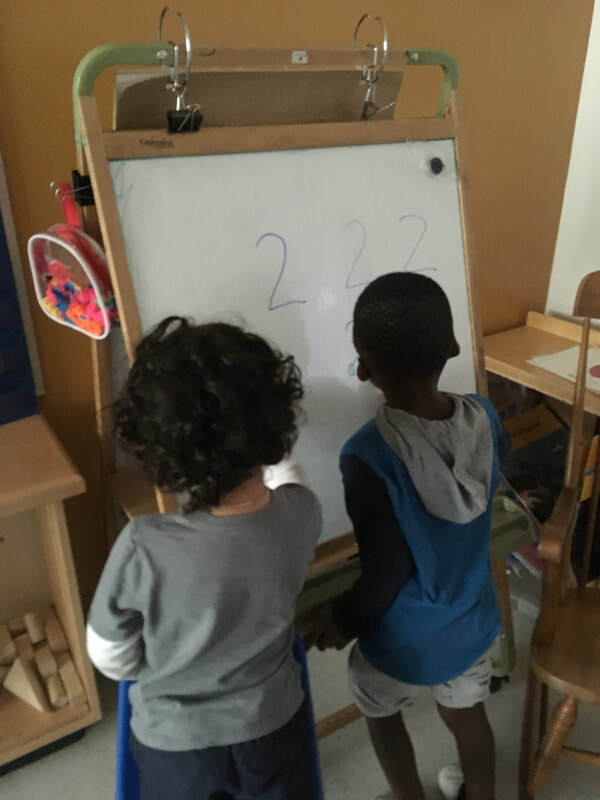 The children are slowly becoming experts on proper times to wash their hands throughout the day (before lunch, after playing with toys, after using the washroom). We have also been learning to sneeze into the crook of our elbow to prevent our germs from travelling around the classroom. The children are learning to become little innovators through asking questions. We are encouraging them to ask questions throughout the day in different contexts. Some questions that help spark their thinking during a learning experience are “what do you think will happen if....?”, “why do you think…?” or “how did you know…?”. Thank you to everyone who signed up for the Playdough Club. We will be sending home requests throughout the year. Please check your child’s mailbag. To avoid any lost items, please write your child's name on all of their personal belongings. Please check your child's mailbag each night. Your partners in Catholic Education. It’s hard to believe that the month of December has arrived already! When we see all the boots, mittens and hats, we are quickly reminded that winter is just around the corner. December is always an exciting time in the classroom. It is a joyful period as we wait and prepare for the coming of Jesus. During Advent, the children enter into the holy season through story, ritual and symbol. The children will be waiting and preparing their hearts for the birthday of Jesus. They will be listening to and retelling the Christmas story and celebrating the gift of God. Every week, we will have an Advent celebration. Through songs, the symbols of light and the Advent wreath, the children will be experiencing the gift of God coming among us. As well as preparing for Jesus’ birthday, we will be discussing preparing our homes for Christmas and Santa’s visit. As mentioned above, a big focus of December will be on the Advent season. We will be exploring ways in which to spread hope, peace, joy and love in our everyday lives. We will also continue to talk about how everyone belongs to a community and often can belong to more than one community at a time. Students should know they can contribute to these communities. 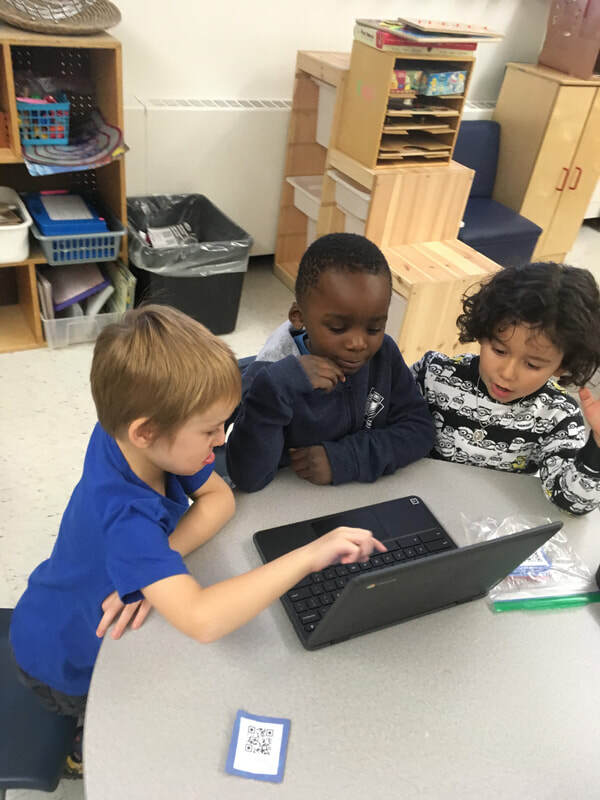 We get excited when we hear that they are making connections between home and school! 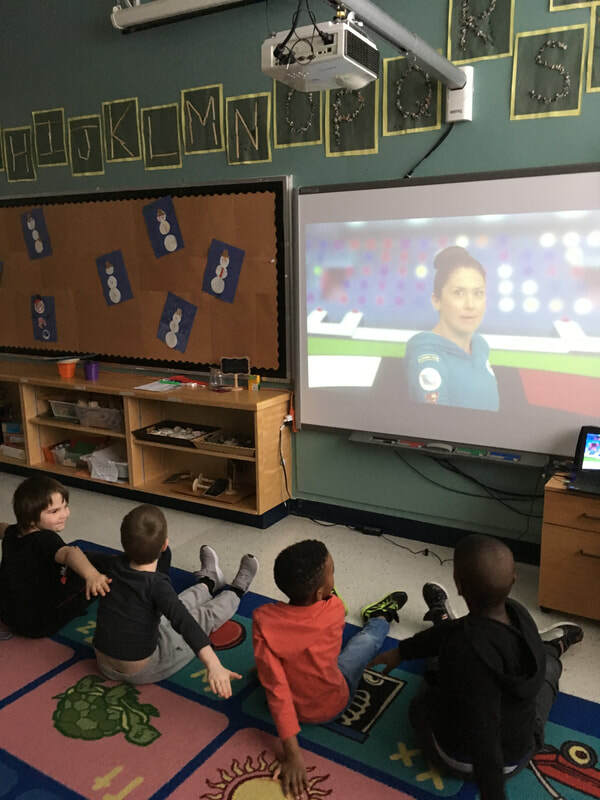 We have been teaching students calming techniques to use to help regulate their emotions. The methods are from a program called Conscious Discipline which is designed to help children with their social and emotional needs. Ask your child to show you the “drain” and “balloon” techniques. 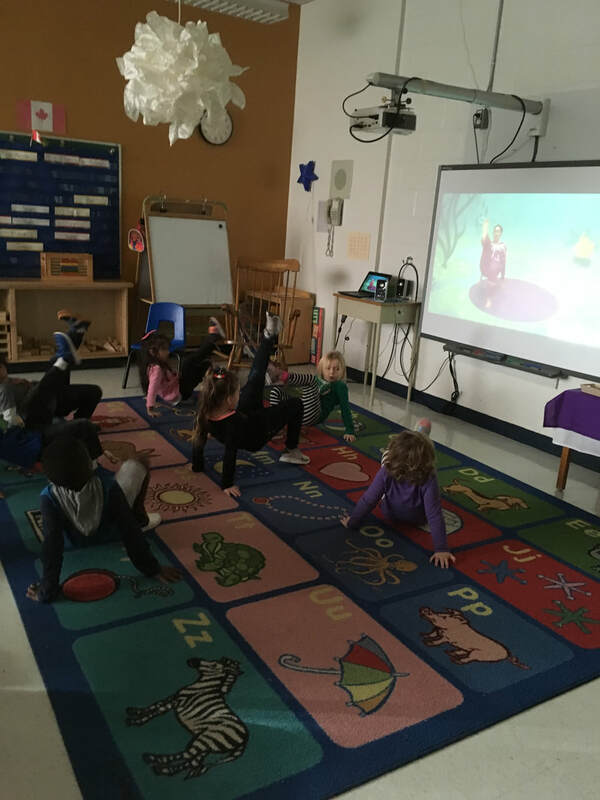 We have also been practicing yoga after rest time, which is another calming exercise that promotes well-being. 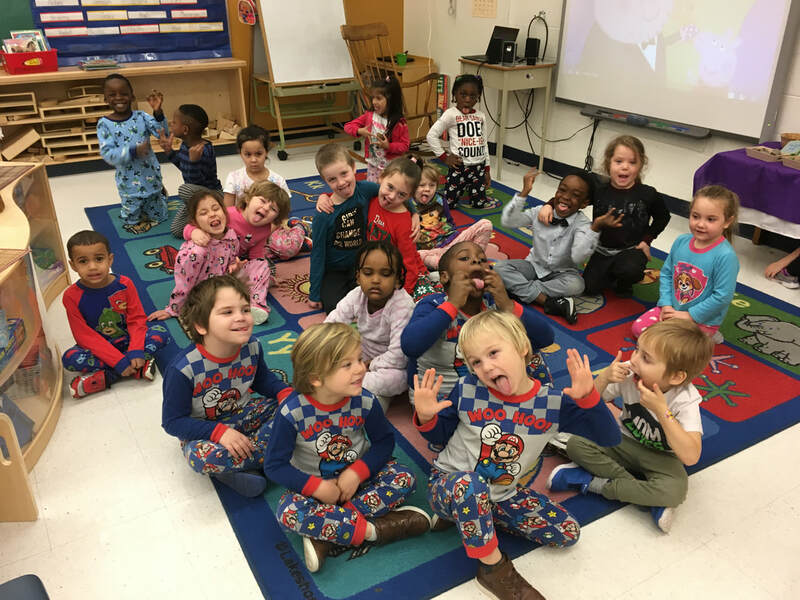 With the cold weather comes many layers, so students have been working on getting dressed and undressed on their own. The order we have been teaching the children to get dressed in their winter clothes is snow pants, boots, jacket, scarf/neck warmer, hat and mittens. The more practice your child has with dressing themselves for the cold weather, the quicker they will get. Layers can be tricky! 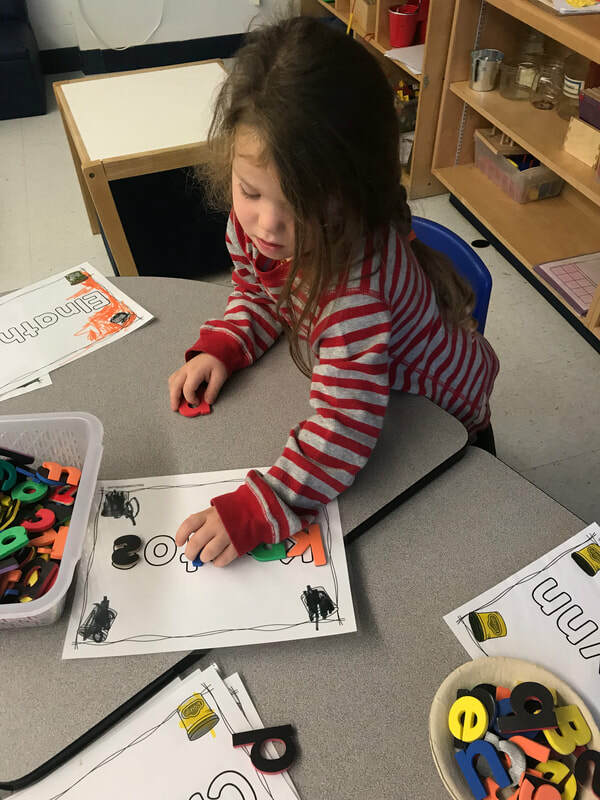 The students have been working on letter sounds for the past couple of weeks and will continue to focus on phonics throughout December. 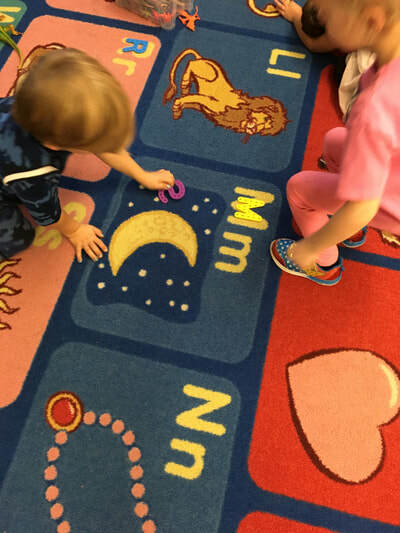 They have been learning to pair letter sounds with actions to help them remember. 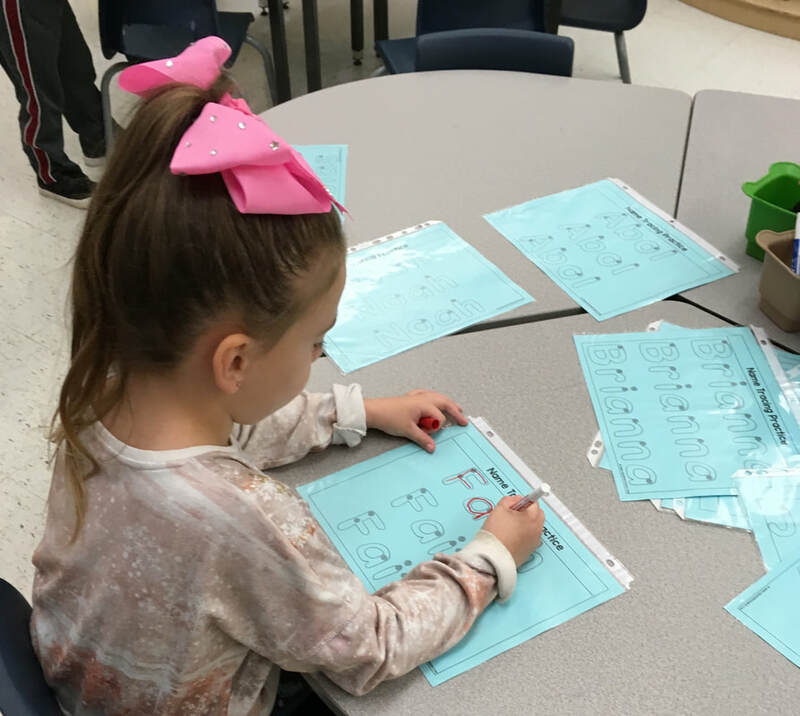 Ask your child to show you the actions and say the letter sound for the letters s, a, t, i, p and n.
We continue to work on number recognition and learning that we can show a number in a variety of ways. 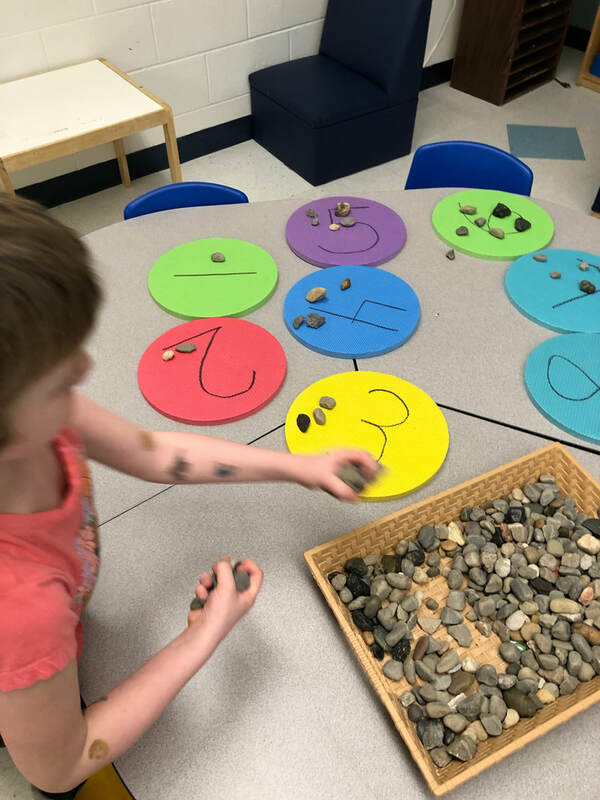 For example, we can show the number 2 by holding up two fingers, having two students stand up or putting two rocks on a ten frame. You can help your child at home by asking them to find different amounts of objects around the house (“Can you pass me two spoons, please?”). This week we are focusing on number two. Here is a fun video that we watch in class. If you watch it with your child, ask them to let you know all the ways they see the number two! We are wrapping up our focus on healthy eating. 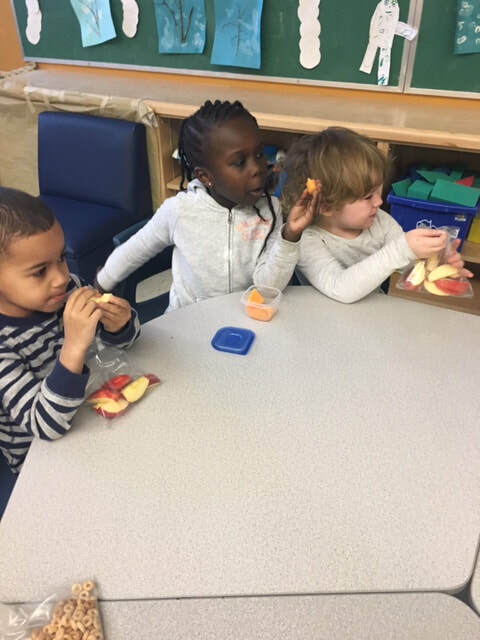 The students continue to pick healthy snacks on their own each morning and have learned the effects of different foods on our bodies, especially why to avoid too much sugar and eat more fruits and veggies. We are still focusing on how to stop the spread of germs through handwashing and good hygiene. 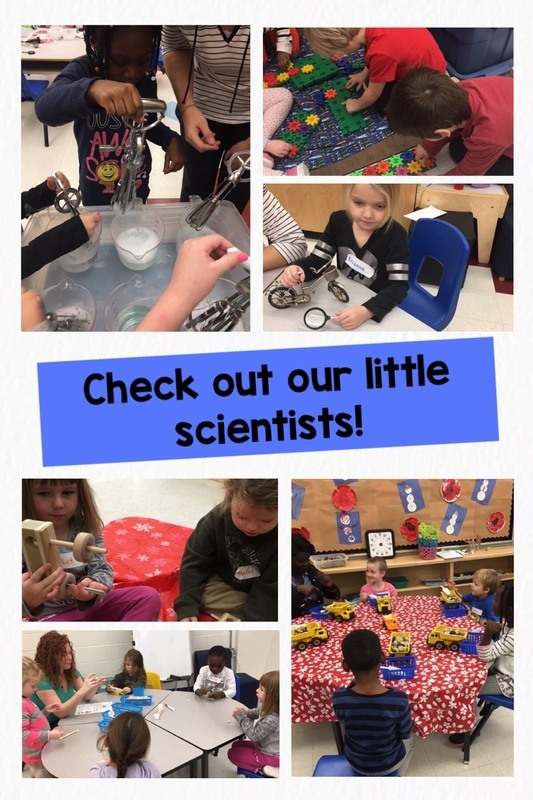 We were lucky to have a Scientists in School workshop last week! The students got to investigate many different simple machines through various hands-on activities. They had fun exploring Science centres in groups and even made a lever, which will be sent home this week. Thank you again to the parents who came to volunteer! December is a cold and wet month. Please make sure your child is dressed warm (snow pants, jacket, hat, mittens) and has spare clothes, especially socks, as we go outside a few times a day. We are running low on Kleenex. If possible, please send in an extra box in your child’s backpack. Please send in a family photo for our Family Tree if you have not done so already. December 21st: Last day of school before Christmas holidays. 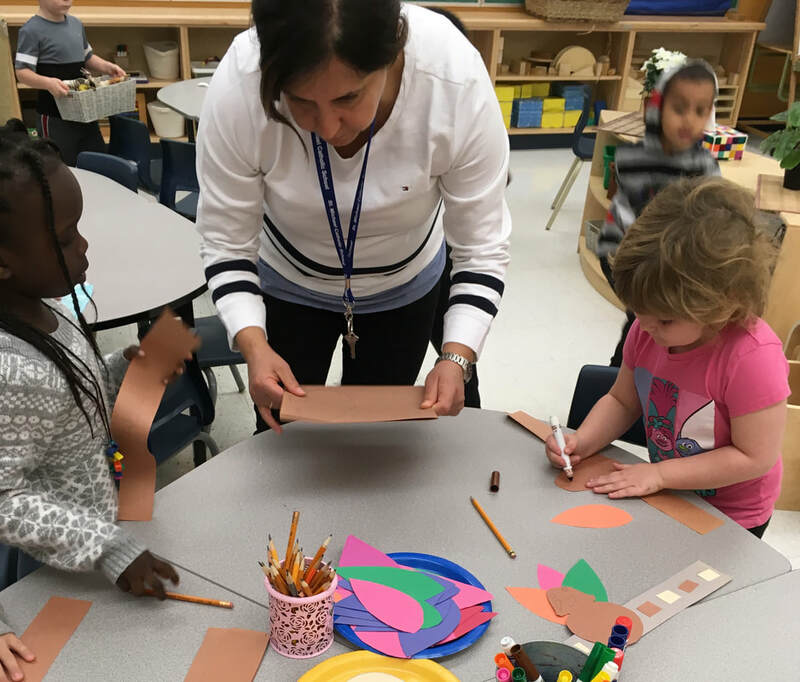 We had a very exciting and educational October in Kinderland. 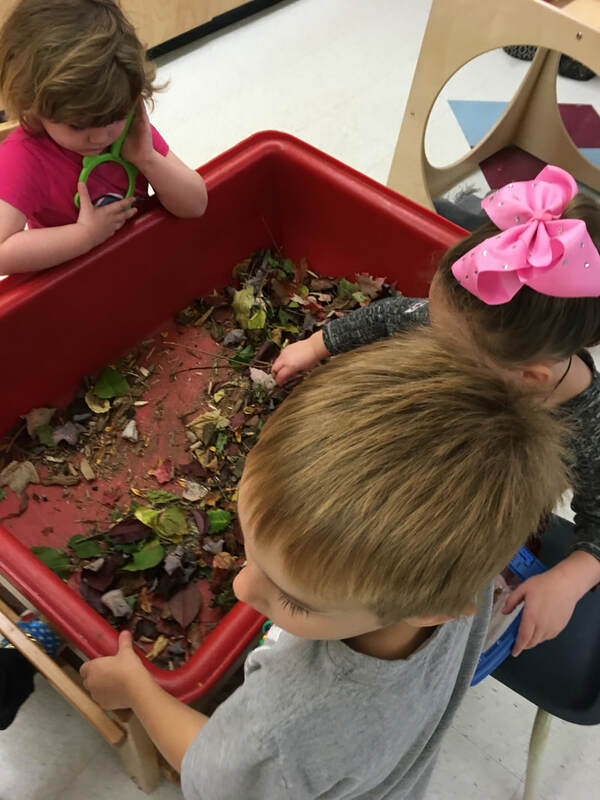 We explored season and weather changes in our yard such as the changing of leaves and discovered that sand turns into mud when it rains. The students have worked hard to be responsible members of the classroom and build healthy friendships. Thank you to all of the families who came out to the Halloween Party. 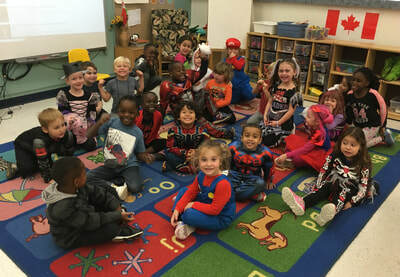 It was great to see everyone dressed up in their spooky costumes! Also, thank you to those of you who donated to the Cake Walk and congratulations to all the winners of the yummy treats! We continue to work on expressing ourselves to others both in the classroom and on the yard. More specifically, students are learning to give and receive positive messages throughout their day. We are teaching them about compliments and how to use an appropriate tone of voice. We are still developing our Family Trees. Please send in a family photo if you have not done so already. We will be talking about how everyone belongs to a community and often can belong to more than one community at a time. We will explore the differences and similarities between school and home and talk about how we contribute to both environments. We will help students read non-verbal cues from others. We often show our feelings and emotions through our gestures and facial expressions. We want students to be able to name their feelings and identify how others may be feeling. Students are learning to solve problems that may arise on their own. 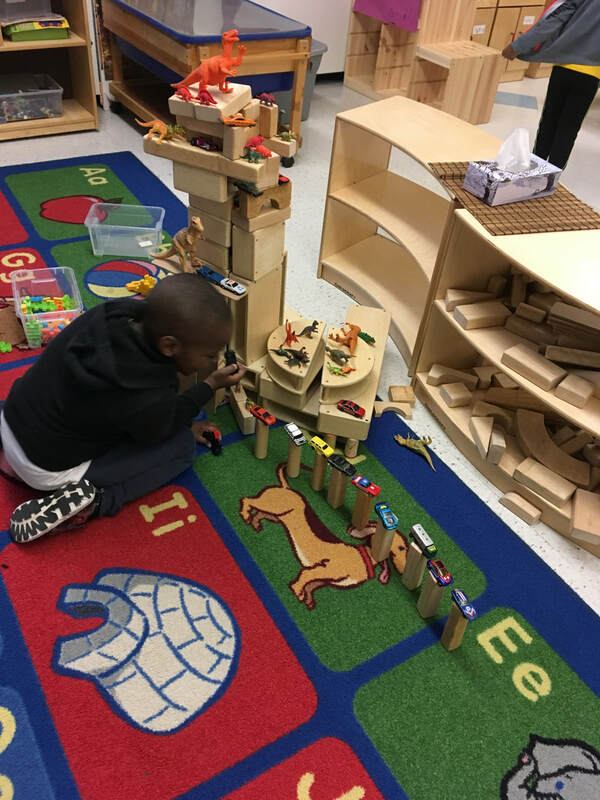 Whether it is a social conflict in the yard or choosing an area to play during learning centers, we want them to realize they have the ability to resolve issues independently. We are teaching them phrases to use, such as "I don't like it when you take the toy from me. Next time, please ask me first", which helps them develop these problem-solving abilities. We hope each student can develop the confidence to solve problems on their own. The students are more comfortable recognizing their names. 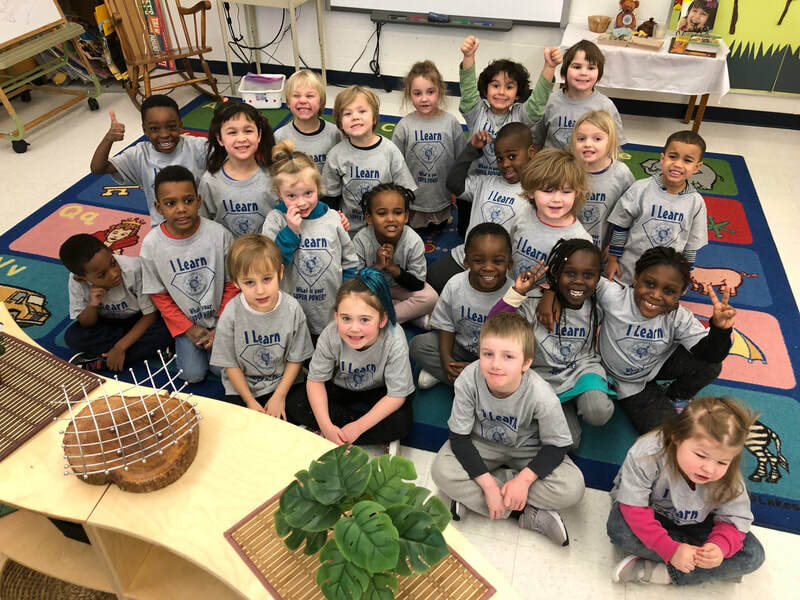 We are happy to see the growth in their learning so far! We are now challenging them to determine how many clap syllables their name or their classmates' names have. You can practice this activity at home with your child. We are working on number recognition, focusing mostly on numbers 1, 2 and 3. We are learning that we can show a number in a variety of ways and that we see numbers all around us. 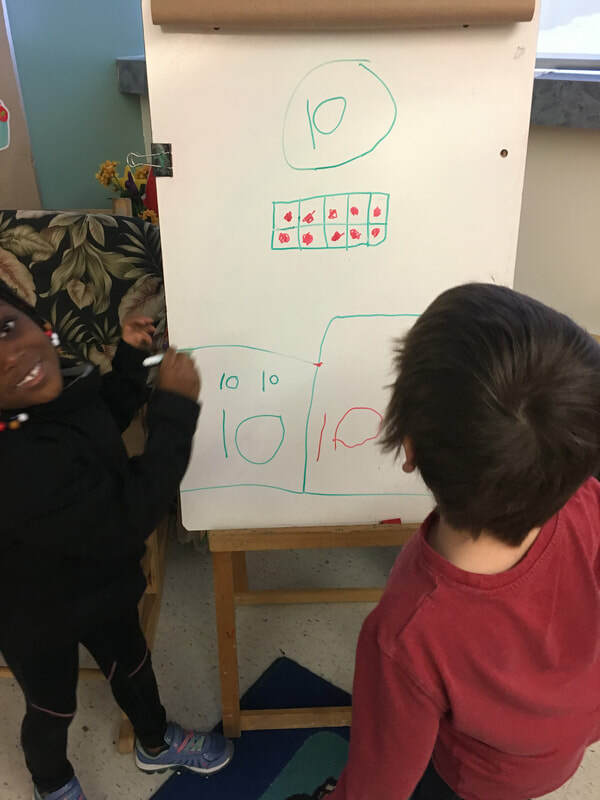 For example, we can show the number 1 by holding up one finger, having one student stand up or putting one rock on a ten frame. You can help your child at home by asking them to find different amounts of objects around the house (“Can you pass me two spoons, please?”). 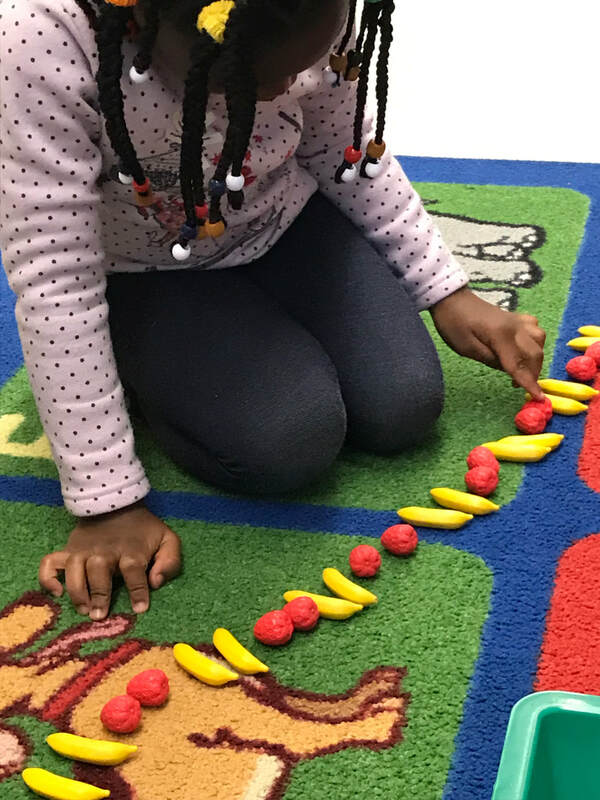 Here are some links to helpful videos that we use at school to help the students learn the alphabet, letter sounds and numbers up to 10. You can also access these under the “Educational Websites” tab. The students have been doing amazing choosing healthy snacks to eat every morning. Many of them no longer need assistance from an educator. We are very proud! We will continue to learn why healthy food is beneficial for our bodies. As the flu season begins, we will be focusing on practicing and discussing personal hygiene. We want students to understand why we wash our hands and the importance of preventing the spread of germs. They will learn that good hygiene is another step to keep us healthy and safe! November can be very cold and wet. 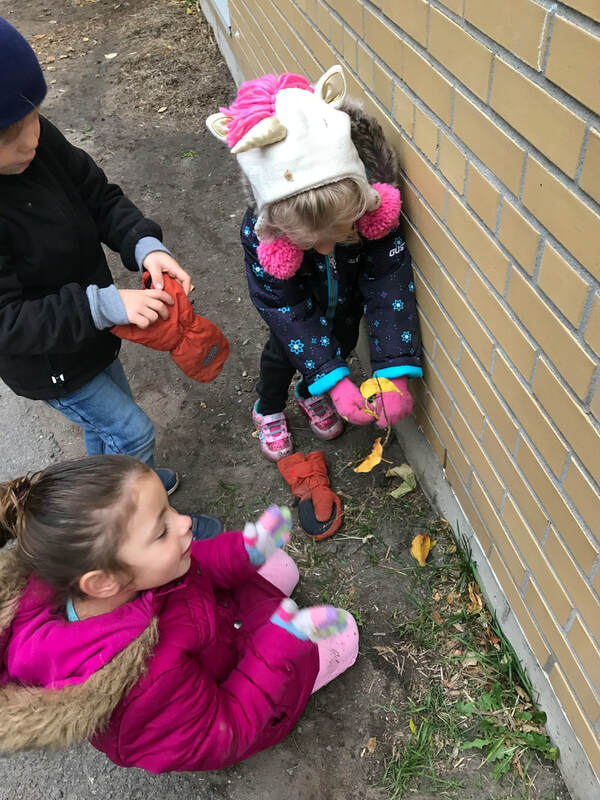 On chillier days, please send your child with a warm coat, a hat and mittens. When it is wet outside, consider having them bring rubber boots, splash pants and an extra pair of mitts. A “Playdough Club” form was sent home in your child's mailbag. 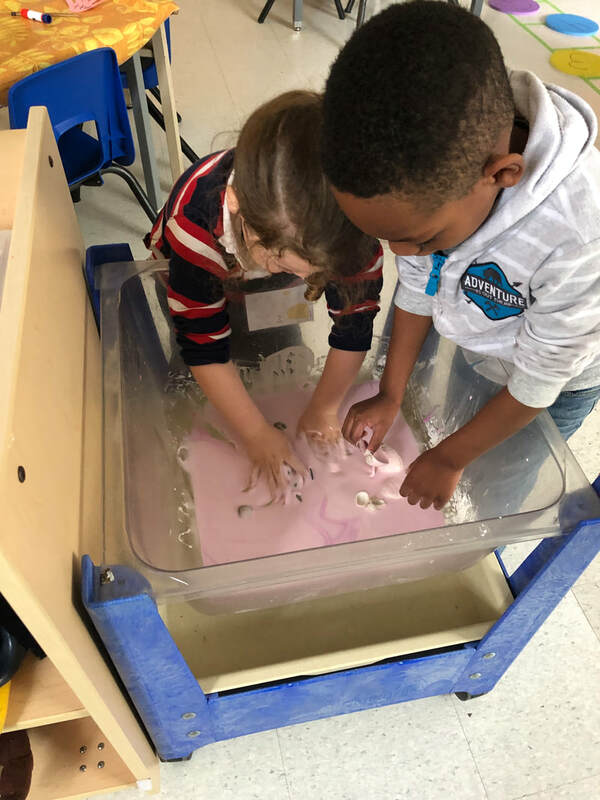 Please consider volunteering to make playdough for the students to use at their learning centers. It is a very open-ended sensory tool. Please send an extra change of clothing for your child to have at school in case of any washroom accidents. We have added some educational websites for students to use at home. Please click on the page link titled "Educational Websites" at the top of this page and explore the sites with your child. The Busy Bees visited the Scholastic Book Fair today. The Friendly Frogs will be going tomorrow. Please check your child's mailbag for their book wish list! Both classes will have a chance to go back to the Book Fair to purchase books this Friday. In keeping with our board's scheduling model, we will be altering our current (French/English) week about schedule to a day on/day off schedule. This means that your child will have French programming with Mme Leman for one day and then English programming with Ms. Potvin the following day. 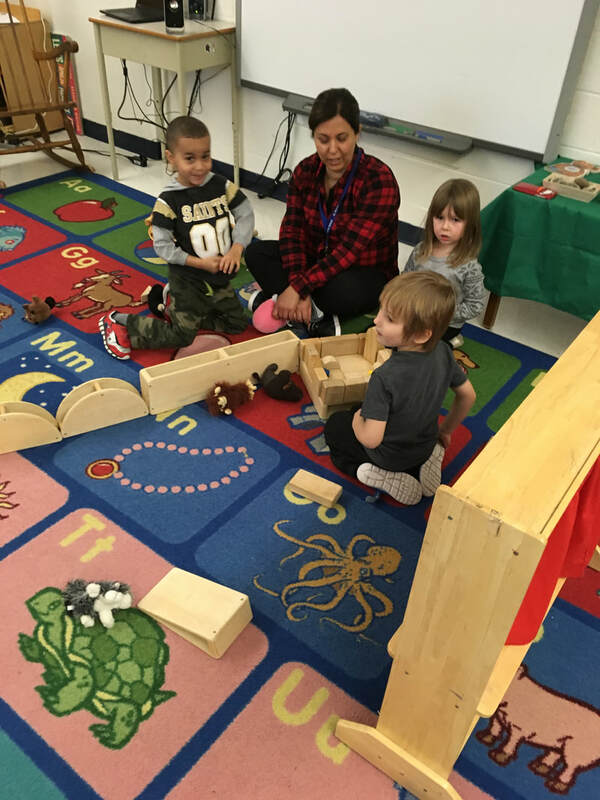 Both the children and the ECE (Early Childhood Educator) remain in the same class at all times, and the teacher moves on a day on/day off schedule. Please do not hesitate to contact Mrs. Langdon or Ms. Bissonnette should you have any questions or concerns. 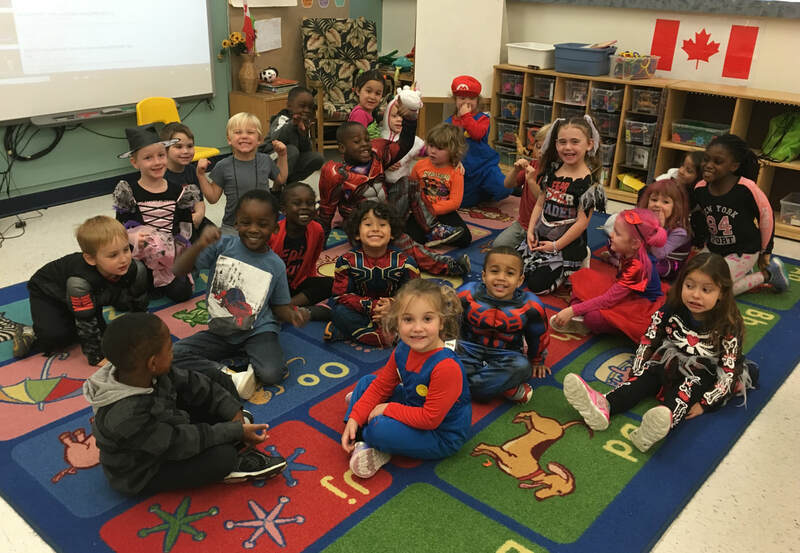 The Kindergarten students had a great first week of October. We had many opportunities to talk about Thanksgiving and how the holiday reminds us to be thankful for all of God's gifts. We were happy to end a terrific week with some popcorn and a movie. Thank you to those of you who donated to the United Way. Very much appreciated! We have been focusing on listening to others and responding to them respectfully. The students have been practicing how to express their opinions and ideas both during whole-class community time and learning centres. 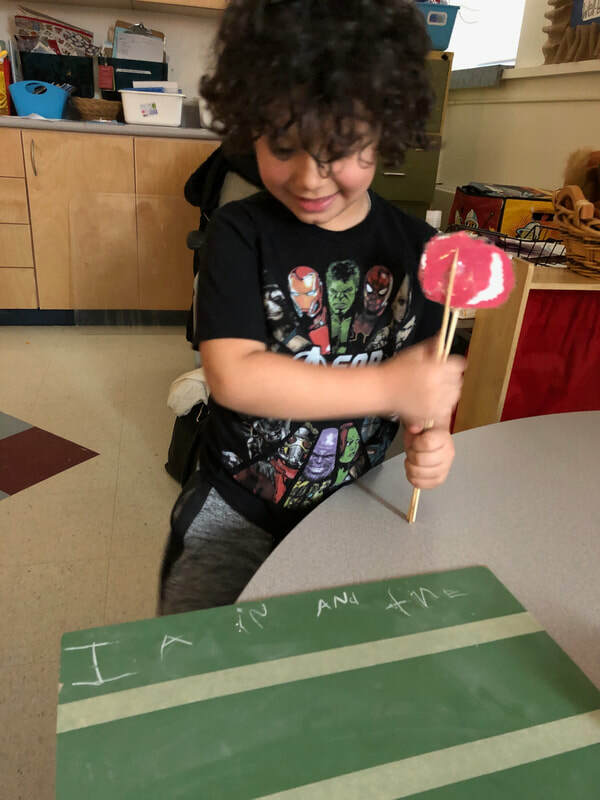 The classes have also done well learning the "We Wish You Well" routine, in which each morning they find their rock with their name on it and place it into the basket on the prayer table. We then wish any absent students well and send prayers and warm wishes their way. This ritual helps the students develop a sense of belonging and creates a positive classroom environment. As we develop our Family Trees, we will be talking about how everyone belongs to a community and often can belong to more than one community at a time. We will explore the differences and similarities between school and home and talk about how we contribute to both environments. The students have been learning to be responsible in many different areas of the classroom. 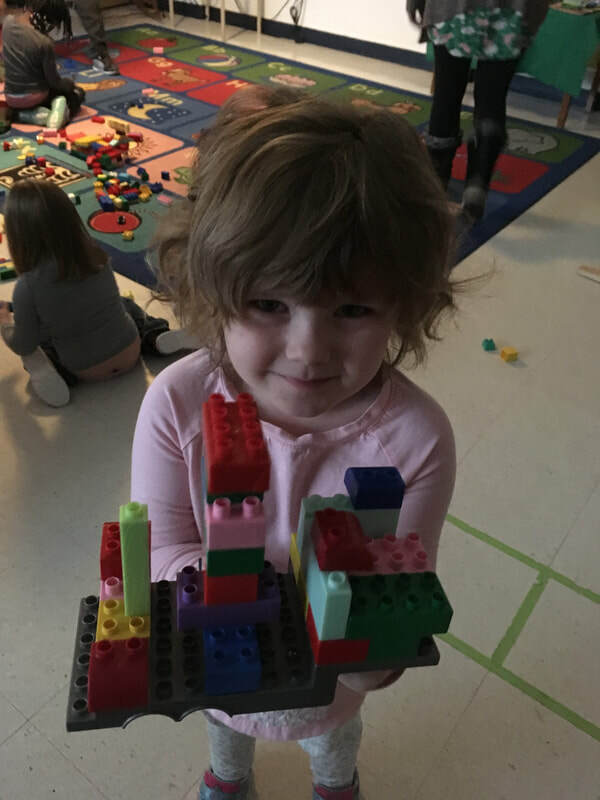 Some examples of how they are showing responsibility are by taking care of their personal belongings, tidying up materials after centre time and asking for help when needed. 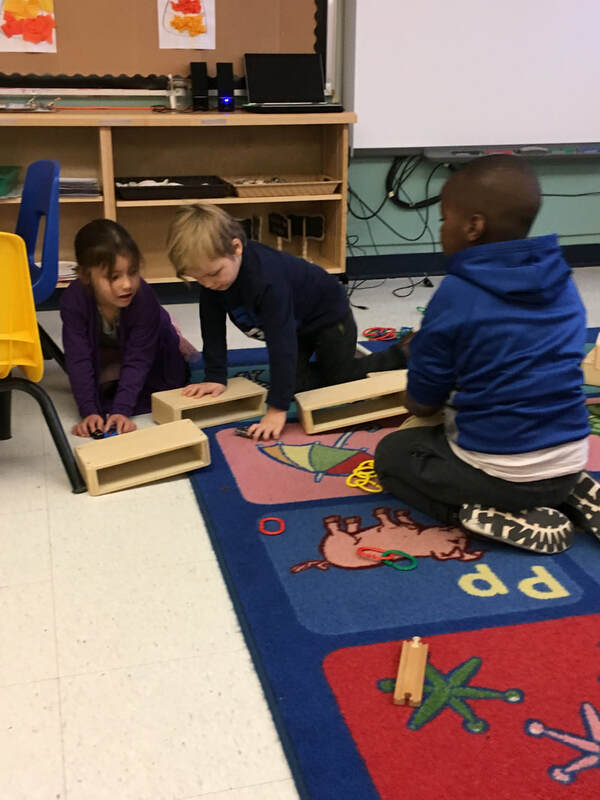 We have also been practicing taking turns during whole-class community time by sitting quietly and raising our hand when we would like to share something with the class. We will help students learn to make new friends and keep healthy relationships by sharing materials, joining in different kinds of play and helping others. We will also explore how to solve problems that may occur in social situations. 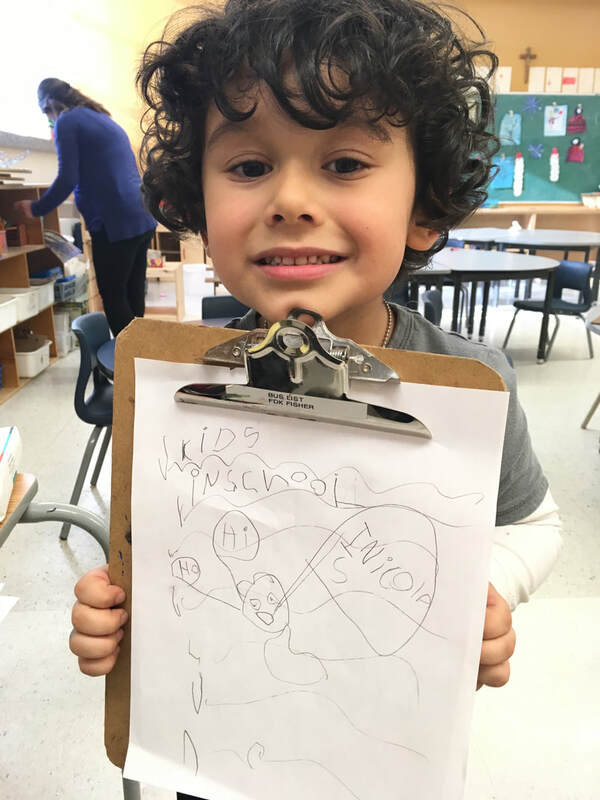 The students have been practicing recognizing and writing their names in a variety of ways each day. 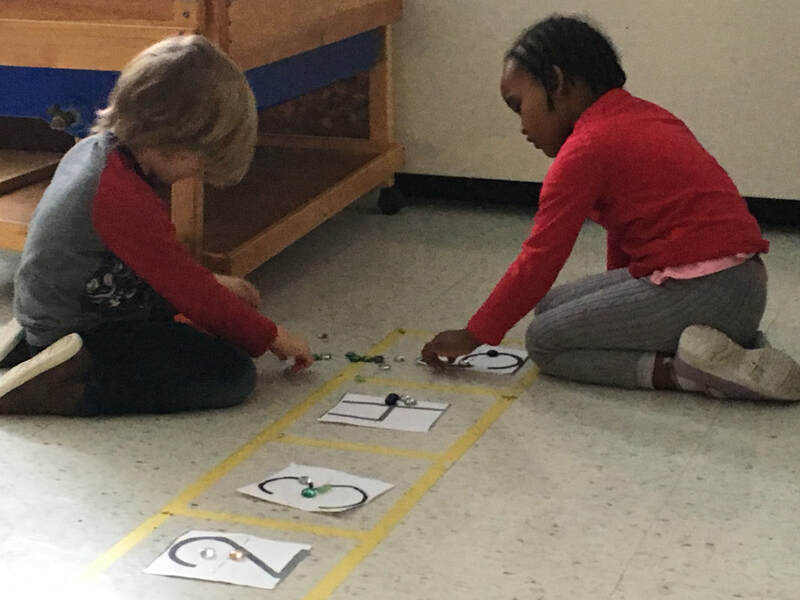 One of the more popular learning centres that the students enjoy is spelling out their name and their classmates' names using magnetic letters. 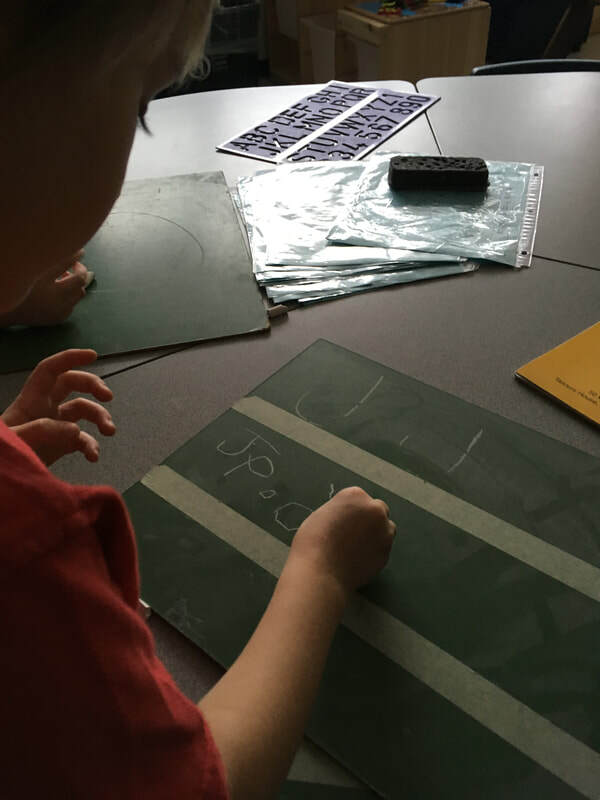 Many students are also working on writing their name using a variety of tools, such as chalk and dry erase markers. Please help your child recognize, spell and write their name at home. Puis-je aller a la toilette? - Can I go to the washroom? They will continue to learn simple French expressions and become more comfortable using the language with others. We will begin to focus more on the alphabet, understanding letter sounds and numbers up to 10. There are many great songs and poems related to letters, letter sounds and numbers, so we know the students will be engaged and eager to learn! Each morning the students have been choosing their healthiest snack to eat. We will be talking more about how healthy foods make us feel and why we eat them first thing in the morning. During the first weeks of school, we learned how to stay safe throughout our school day. 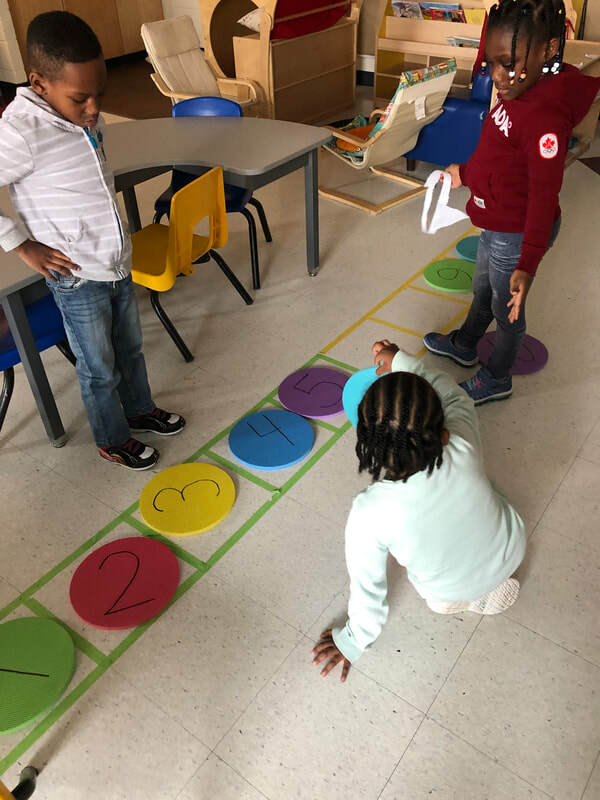 Students are starting to problem-solve by reminding each other of these safety procedures, such as walking instead of running in the classroom and using materials appropriately so that no one gets hurt. We will continue to remind the class of the importance of these safety practices. The fall weather is here, so please make sure your child comes to school with a light jacket/sweater and long pants. 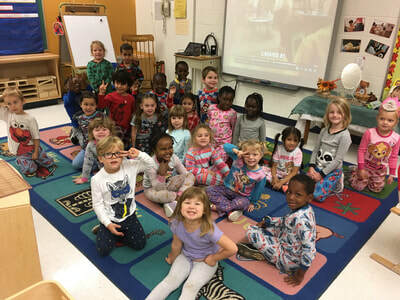 Blankets for rest-time were sent home Thursday. Please wash and return them for Tuesday. Wishing everyone a very happy Thanksgiving with your loved ones. Wow, it’s hard to believe that September is already more than halfway done. A big thank you to all the parents/guardians who took the time to come to the Meet the Teacher Evening. It was nice to see everyone. Also thank you to all the families who sent in extra Ziploc bags, Kleenex boxes, and school supplies. We really appreciate it. 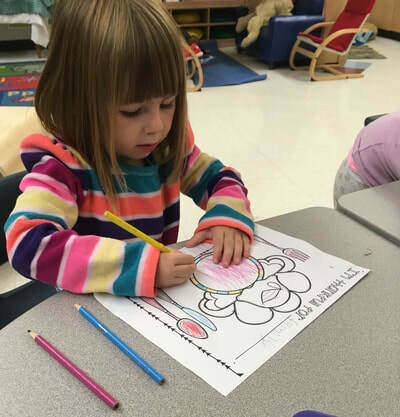 The Kindergarten students have been doing a great job settling into daily routines. We thought it would be helpful to explain these routines in more detail now that the school year is in full swing! If your child is not feeling well or cannot attend school for another reason, please call the school to report an absence at 613-749-1642. If there is no answer, please leave a message on the school voicemail. 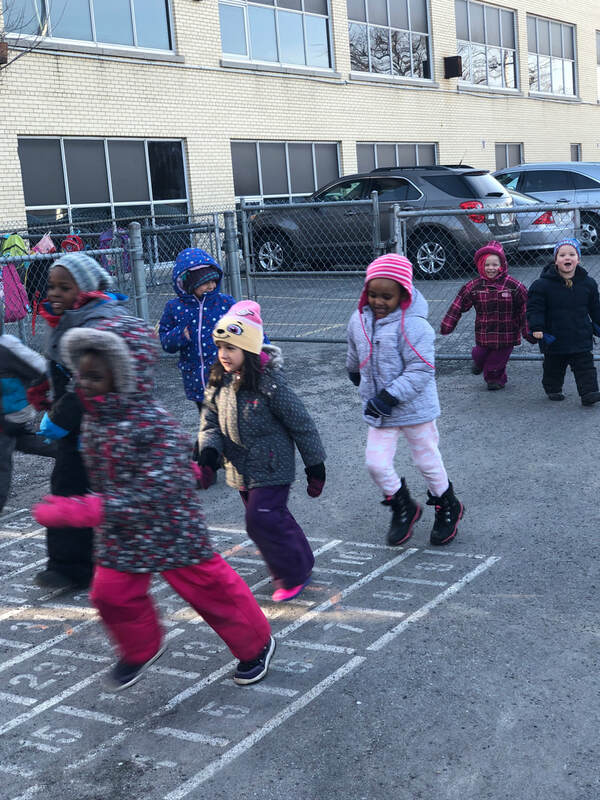 The students have outdoor play three times a day: first thing in the morning, right after lunch time and at the end of the day. Please ensure your child has proper and safe footwear. It is best to avoid sending them with open toe sandals or shoes. Students need to have shoes that are enclosed to play on the play structure. We recommend Velcro shoes because they are easy to put on and safe. The students have two full blocks of learning centres a day, one in the morning and one in the afternoon. 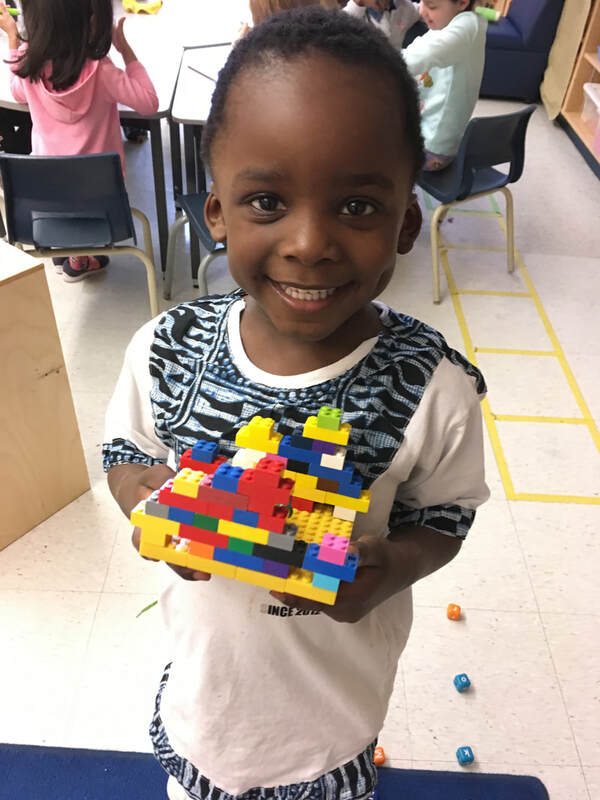 At the start of each learning centre block, we start with a whole-class community time. The topic changes based on students needs and interests. 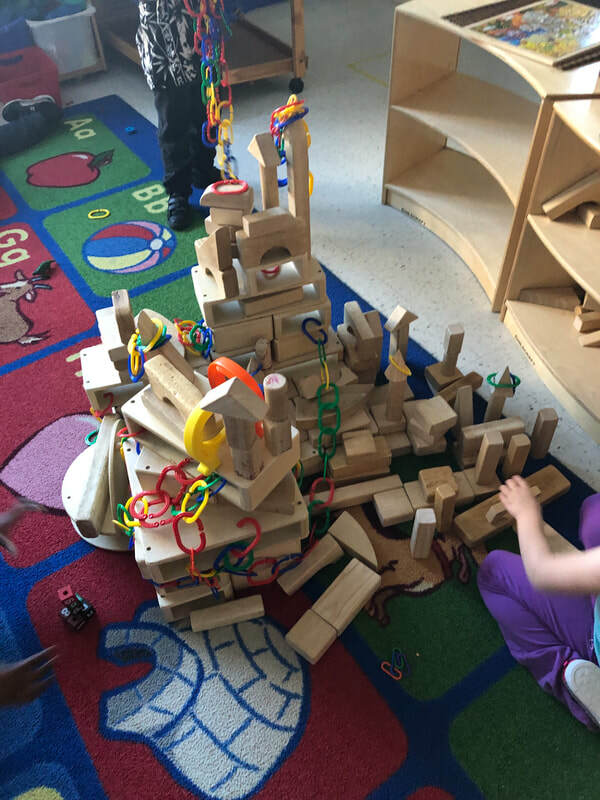 As students explore different centres, they learn to self-regulate, collaborate with others, develop early math and language skills and practice their problem-solving abilities. Students can have a snack at any time during the learning centre blocks. We have been teaching students to eat their healthy snacks in the morning. The students eat their lunch together at 11:15 am every day. After lunch, the students have their second outdoor play time. The students have rest time daily after lunch/outdoor play for about 30-40 minutes. They are expected to lay down on their mats or blankets while they rest their bodies and listen to calming music. Some may fall asleep which is fine because it means they need the rest. If a student does fall asleep, we do not wake them right away and allow them to have an extended rest time. Please let us know if your child is having trouble sleeping at night because they are napping too long at school. The school day ends at 3:00 pm. 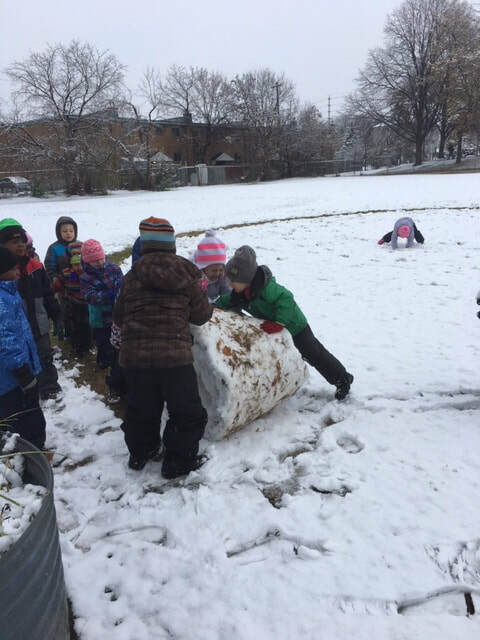 The students go outside to the Kinder yard around 2:45 pm for outdoor play (the yard closest to the parking lot). We dismiss the students who are walkers to their parents/guardians as they come to the gate. We then walk the bussers to the bus and make sure they get on safely. Please contact the school if someone new is picking up your child. They need to bring a piece of identification. This process is to ensure the safety of each child who attends St. Michael. Please check your child’s mailbag. The Terry Fox pledge sheet, Parish walk permission form and Family Tree note were sent home today. Please make sure that you have sent in an extra change of clothes for your child. Accidents can happen to anyone! Please send in a Kleenex box donation if possible.